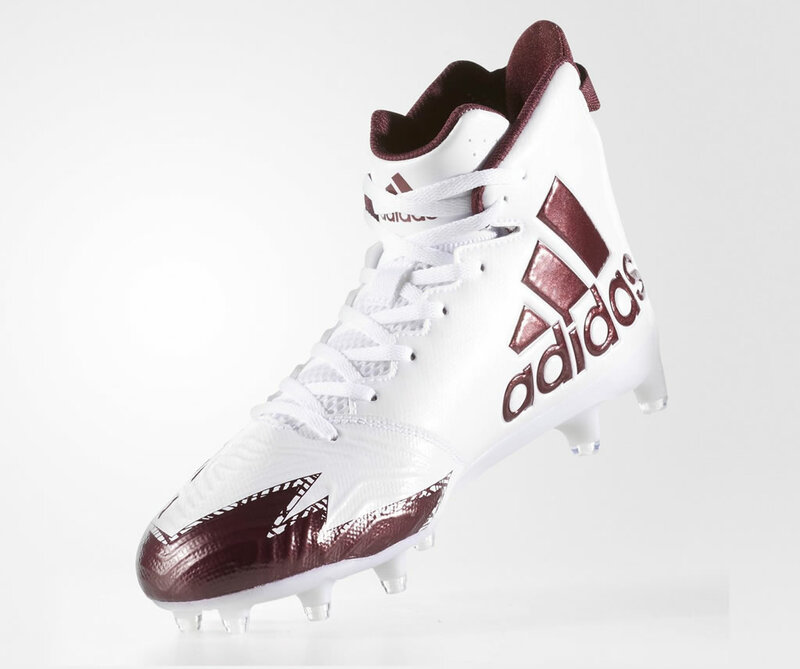 Owning a great pair of football cleats is very important if you take this activity seriously, especially since football is one of those sports where high-quality equipment can improve your performance while keeping you safe on the field. Below you will find a list containing 10 best football cleats of 2017, all of which are perfectly capable of giving you the best traction and comfort. 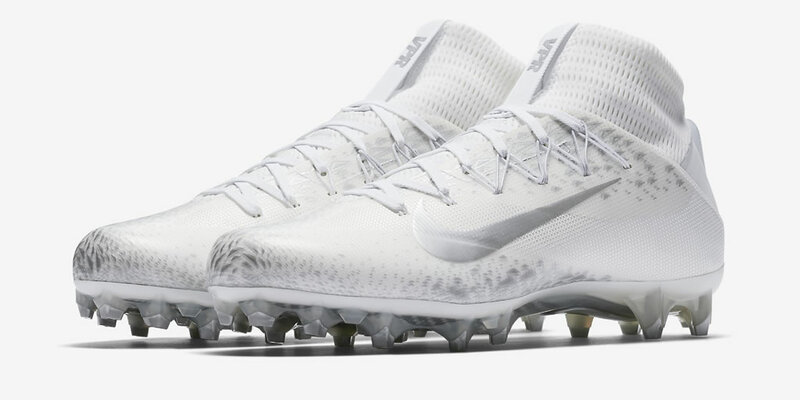 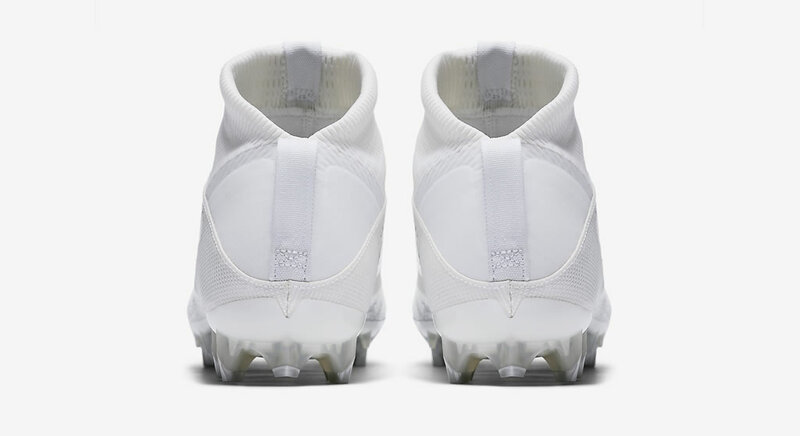 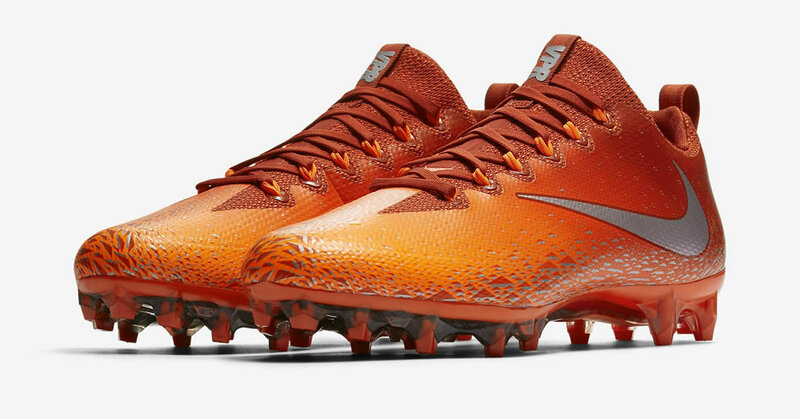 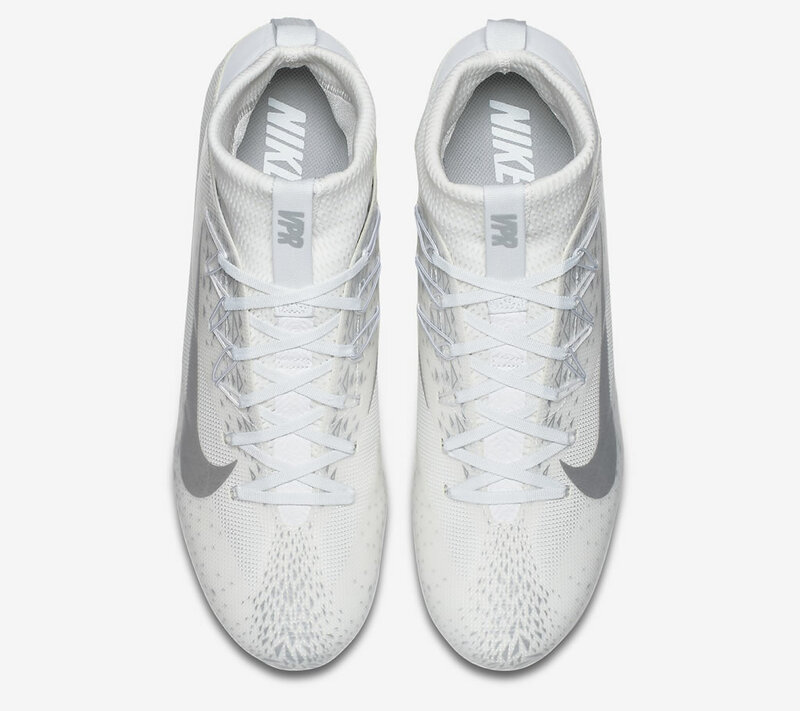 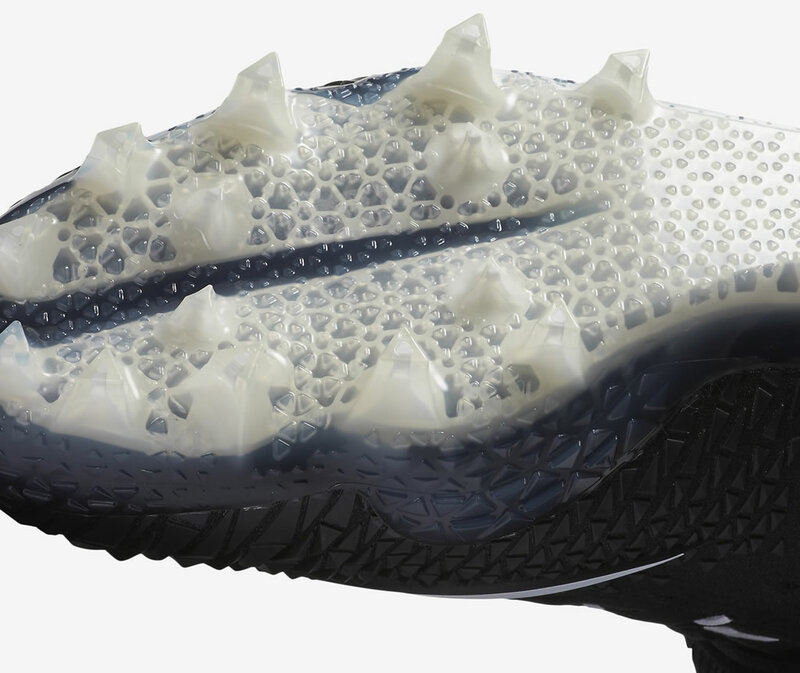 Available in various colorways, the Vapor Untouchable Pro is one the pair of football cleats made by Nike for speed, and it comes equipped with a upper made with mesh and synthetic skins, which ensures lightweight support and a perfect lockdown. 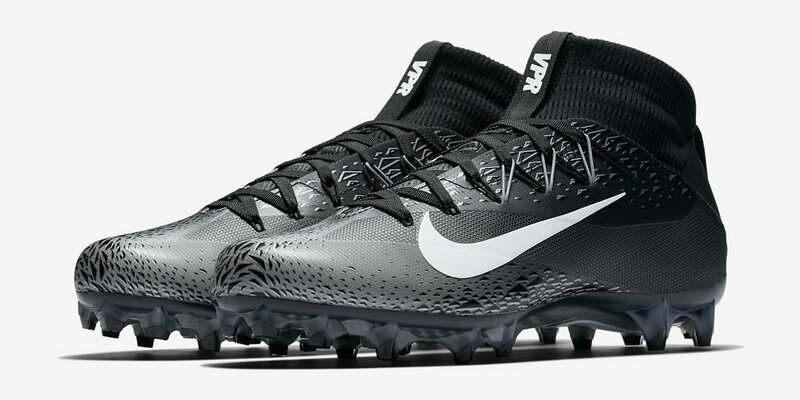 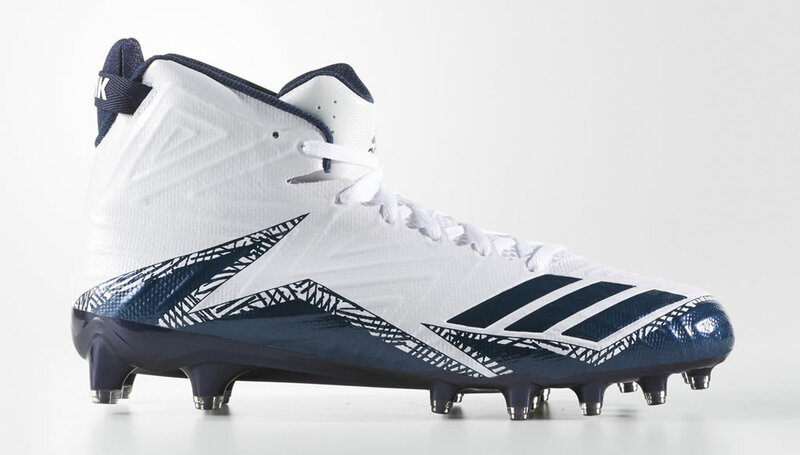 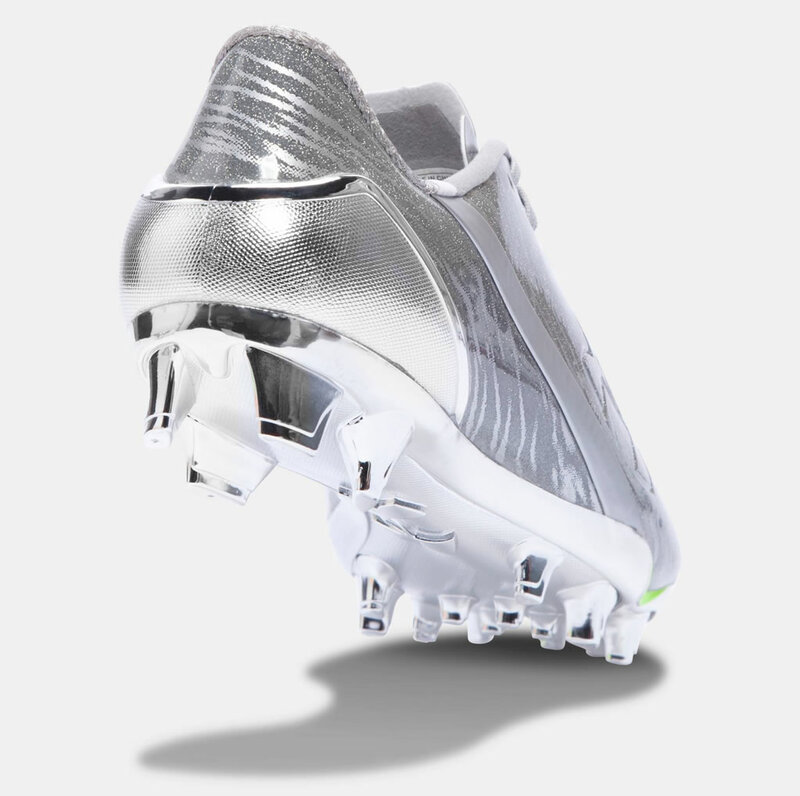 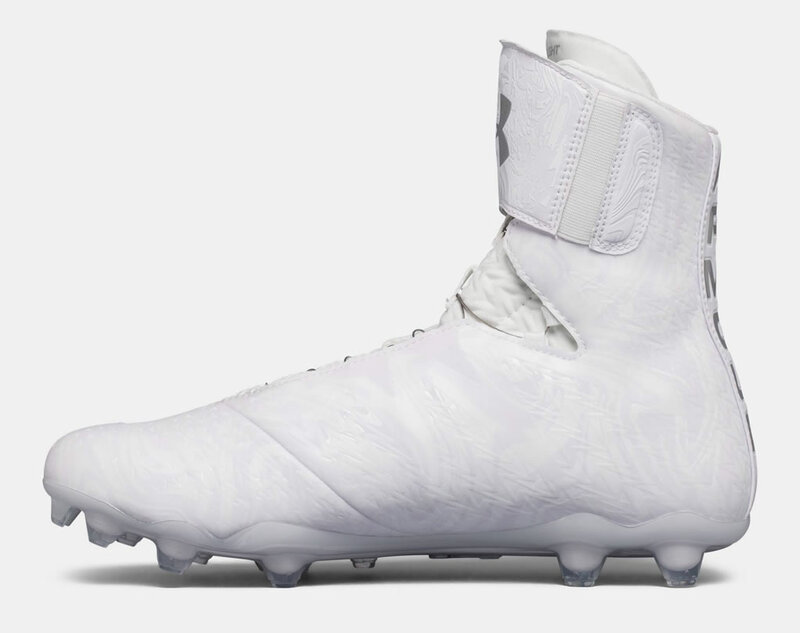 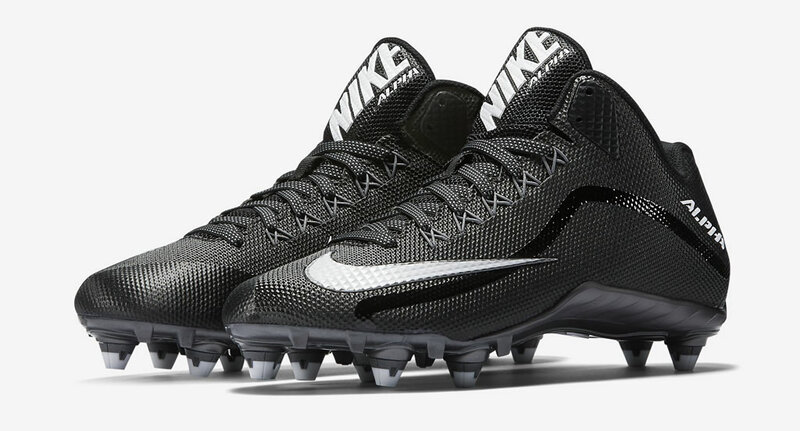 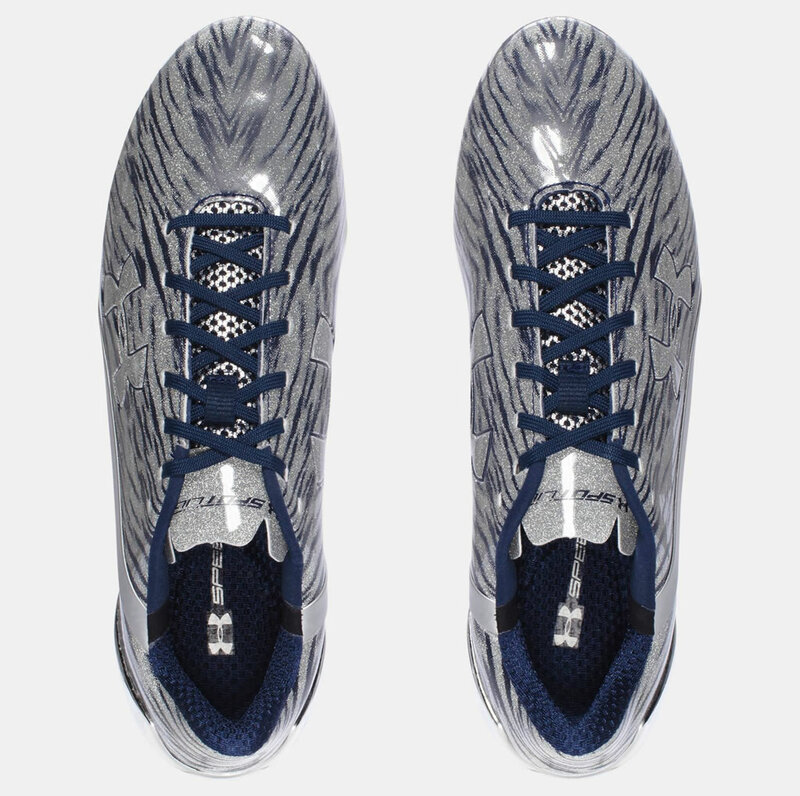 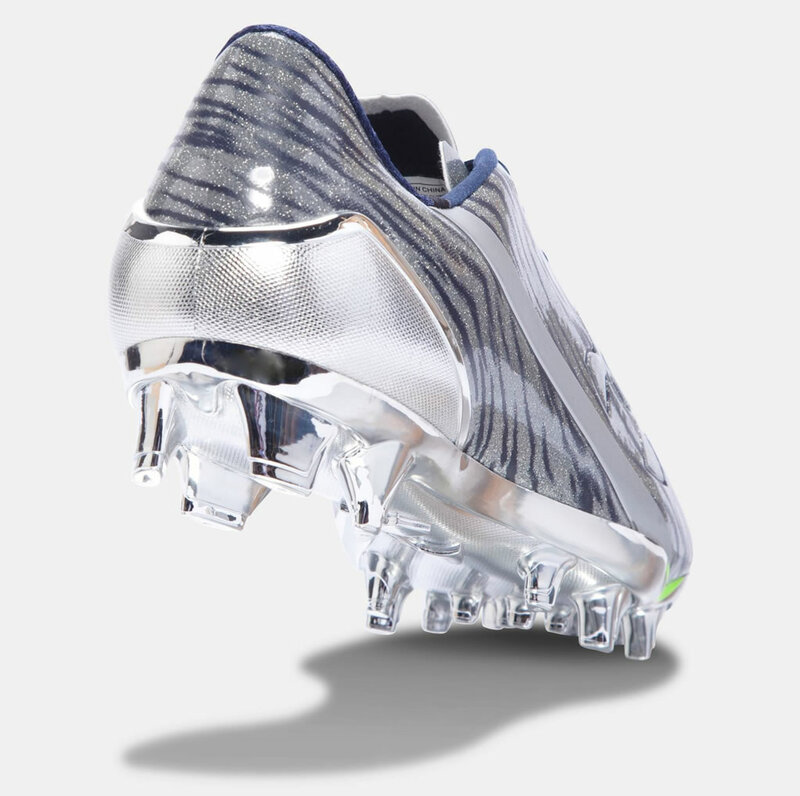 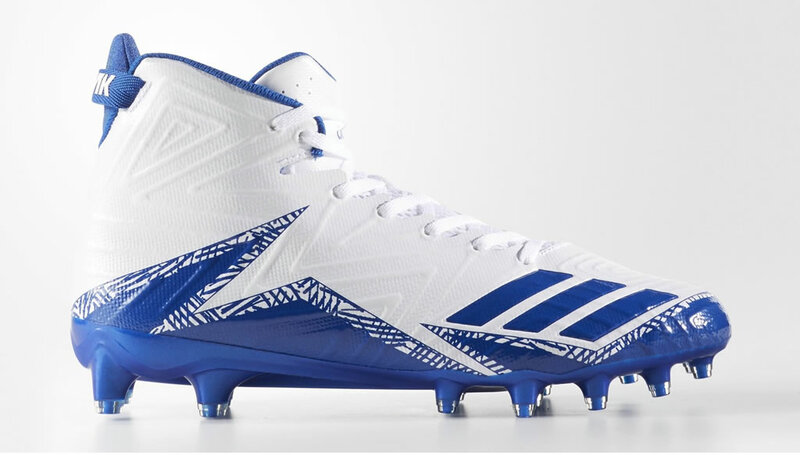 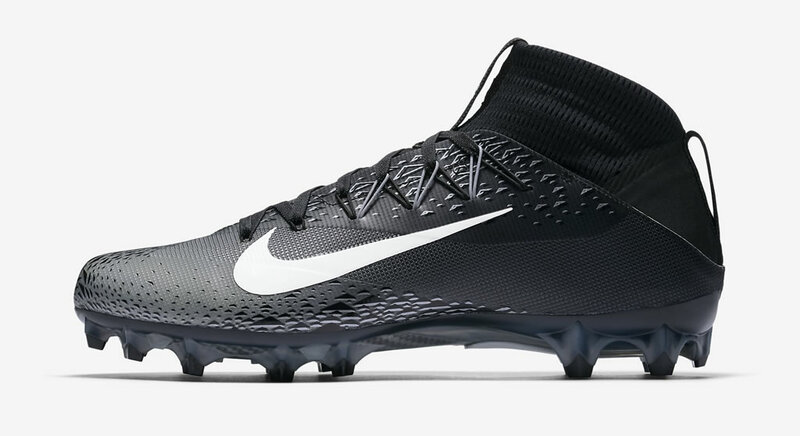 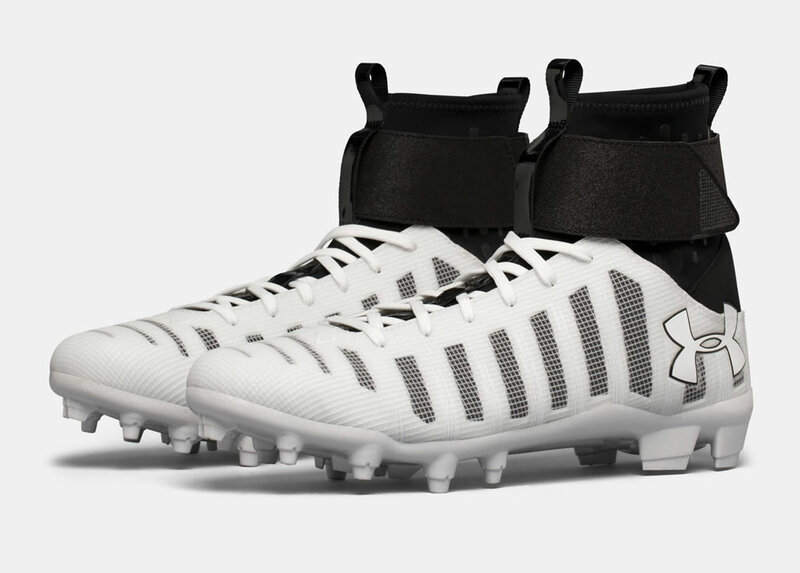 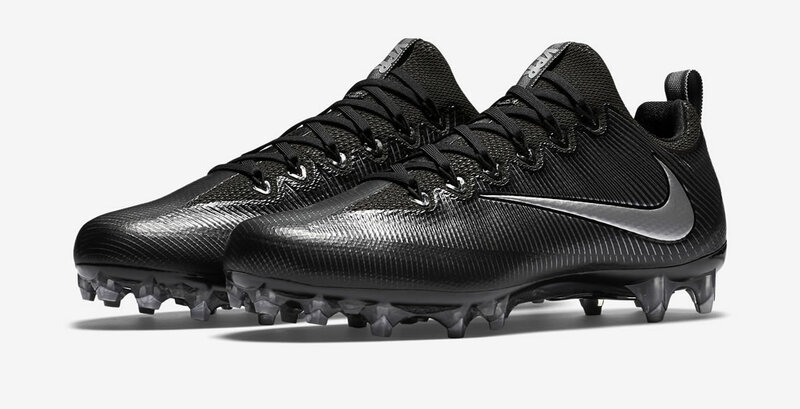 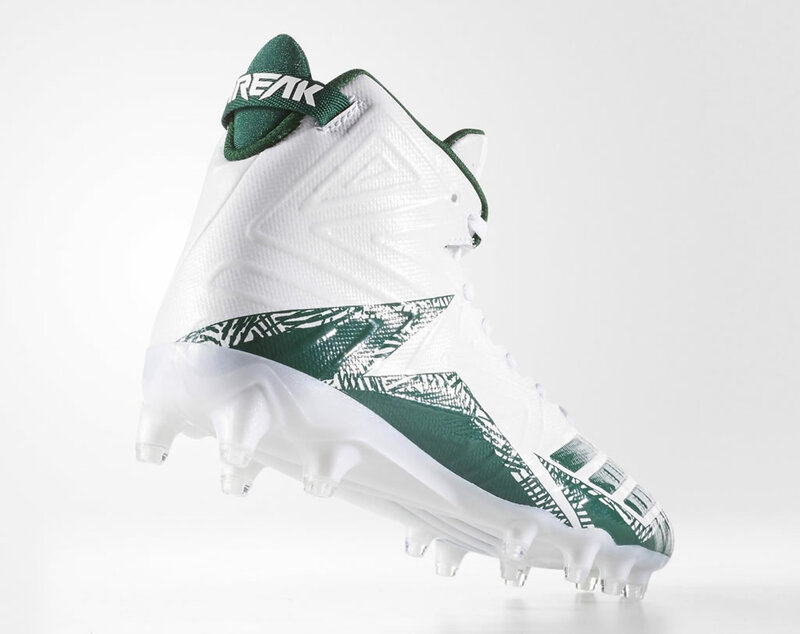 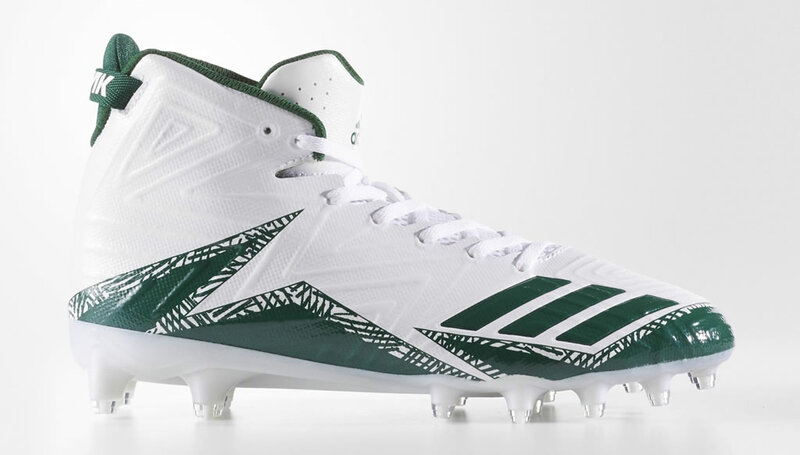 Designed for aggressive skill players, these football cleats feature an one-piece inner sleeve that wraps the ankle, as well as a carbon fiber plate that provides exceptional stability without sacrificing flexibility. 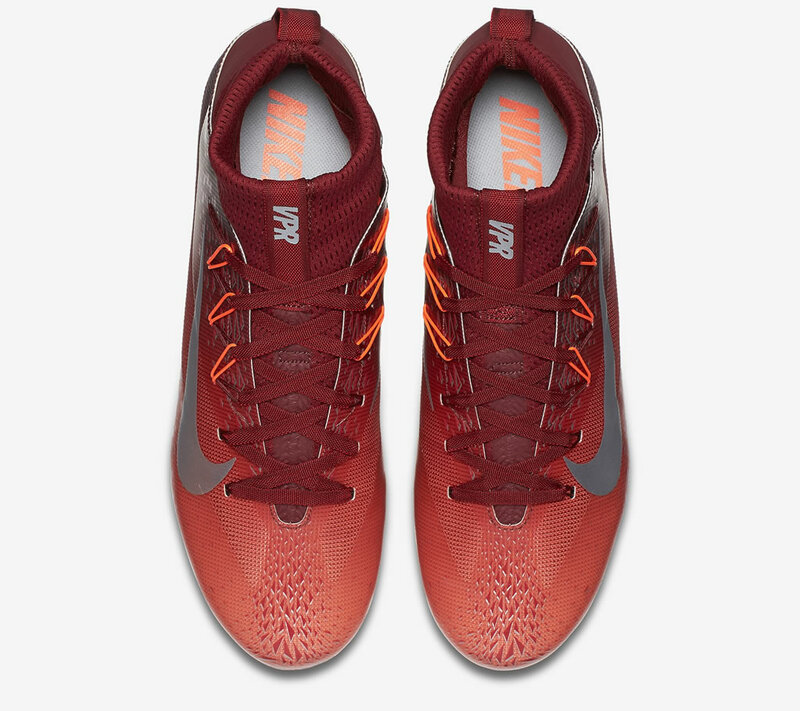 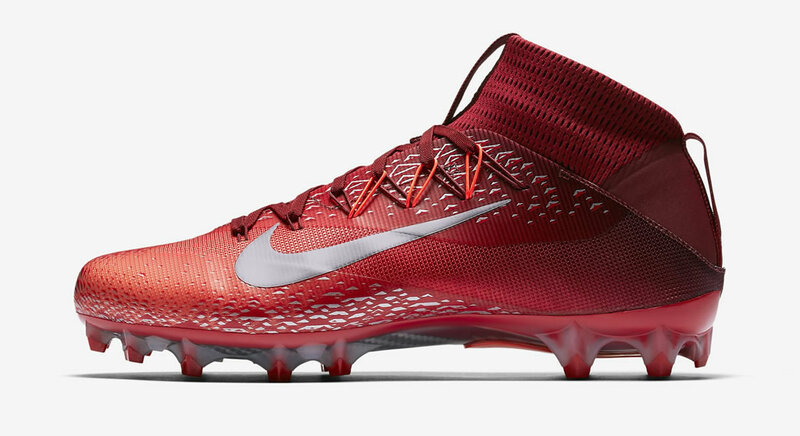 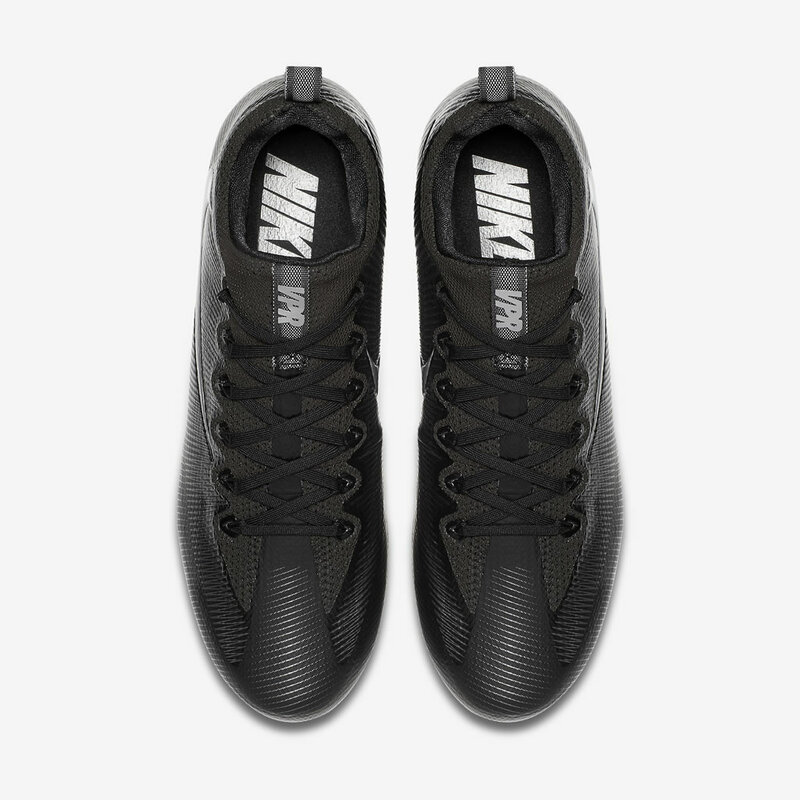 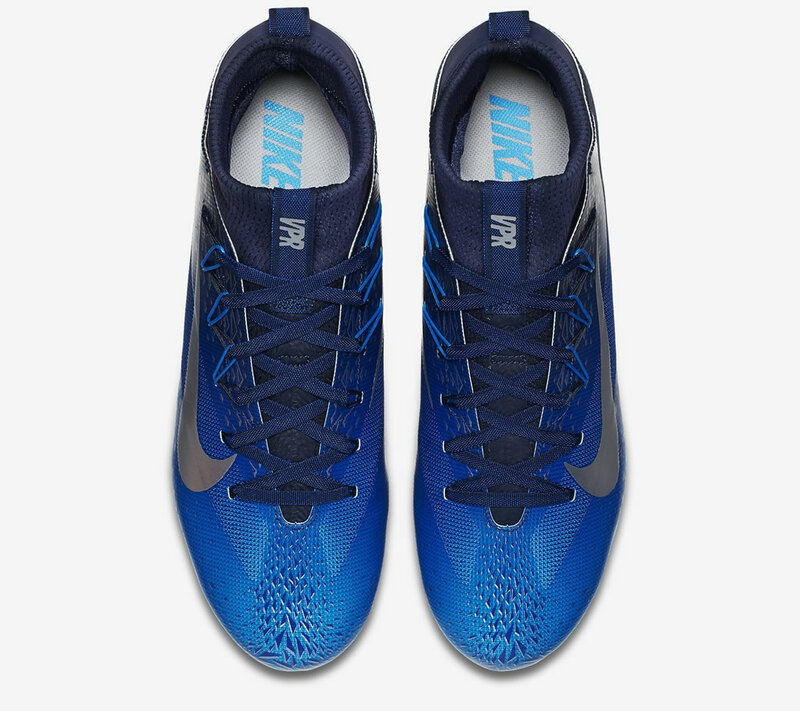 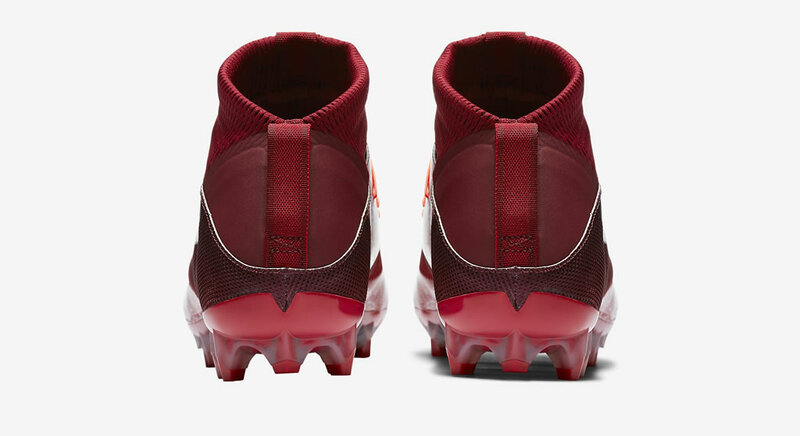 Moreover, you can completely rely on these Nike custom football cleats, as the strategically placed cleats help you change direction and accelerate faster. 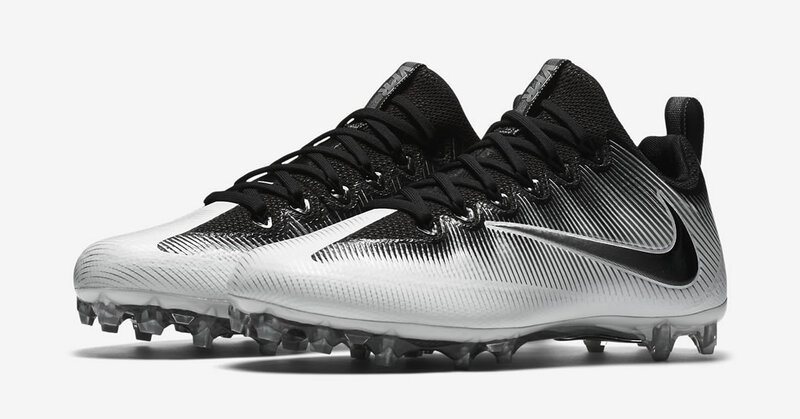 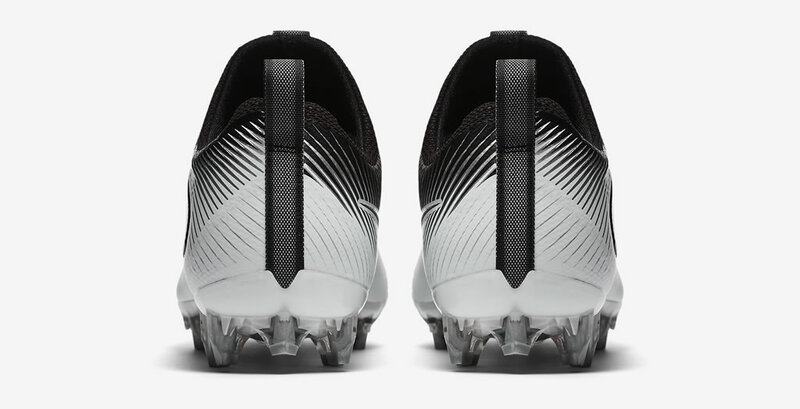 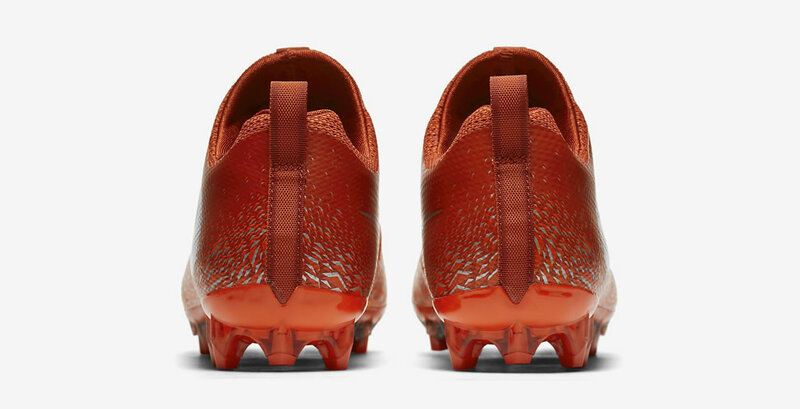 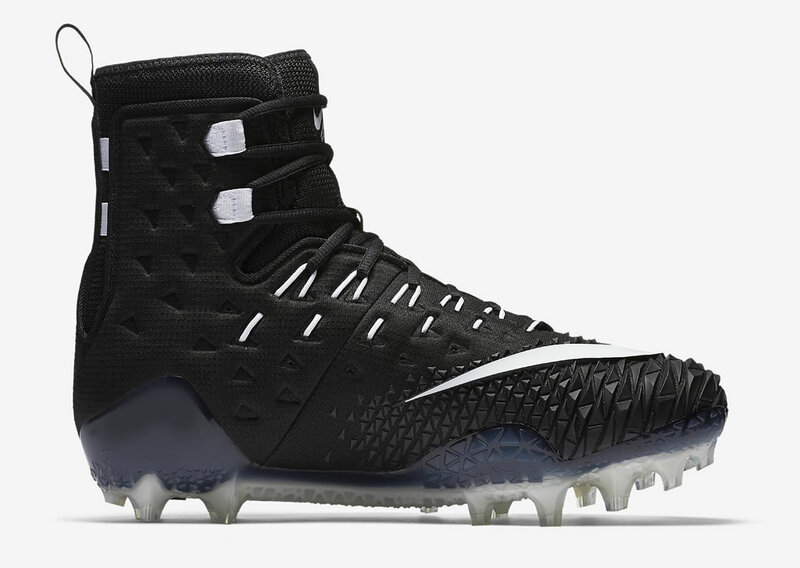 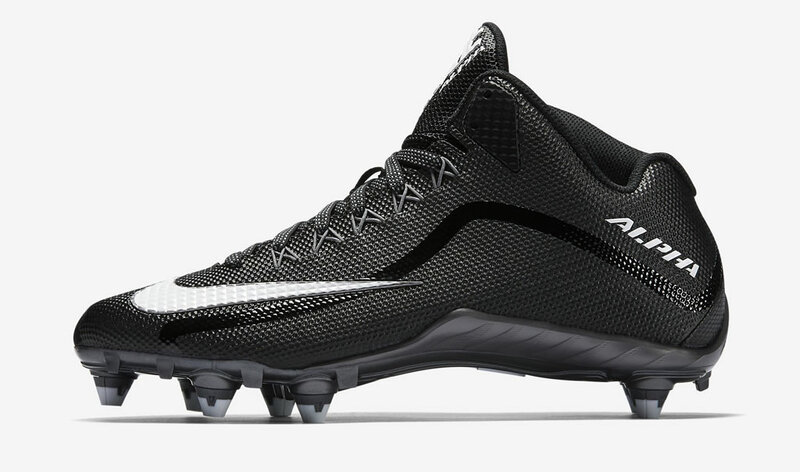 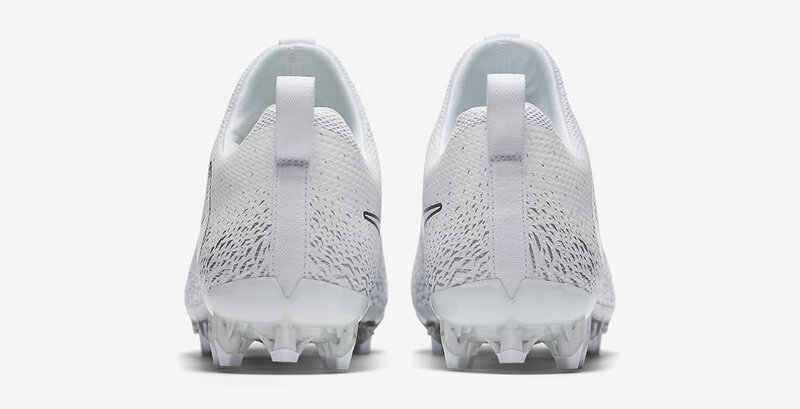 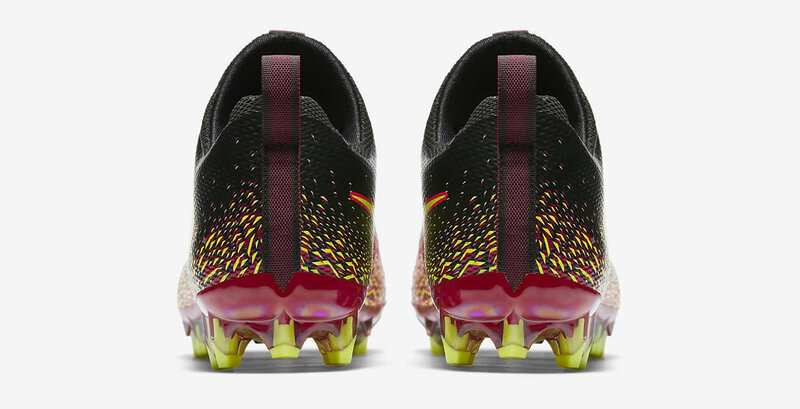 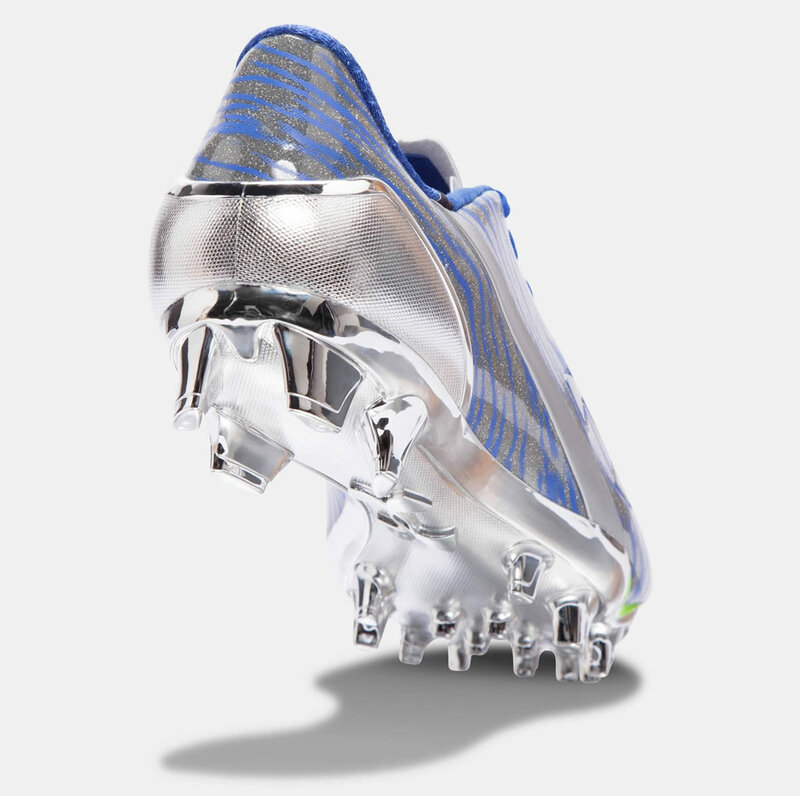 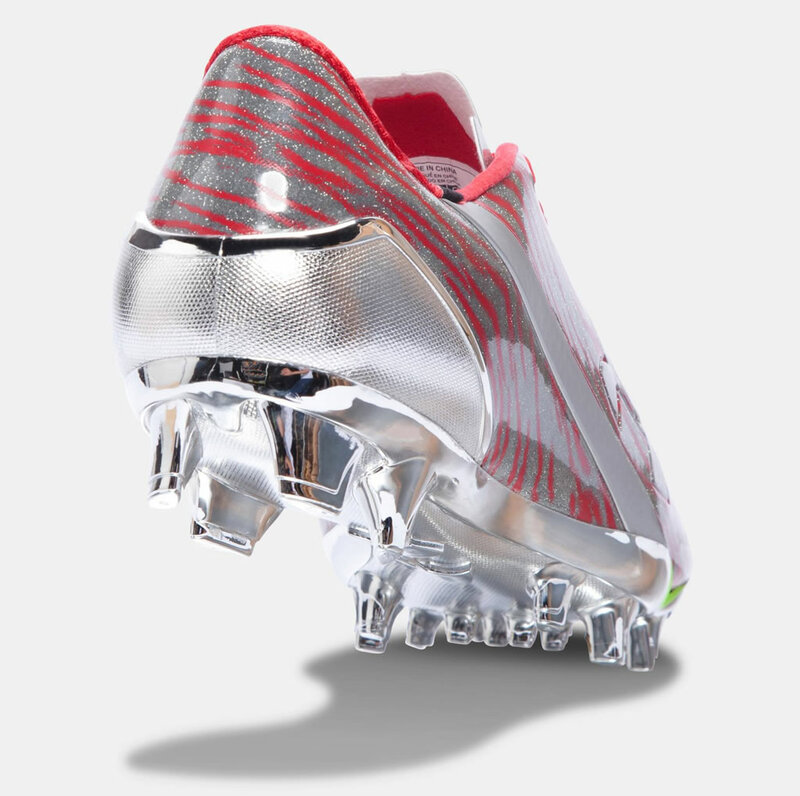 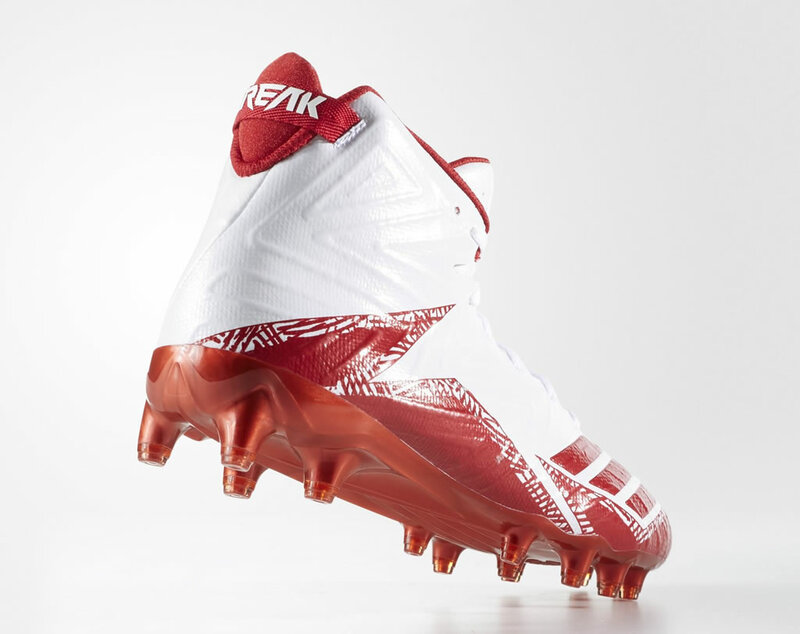 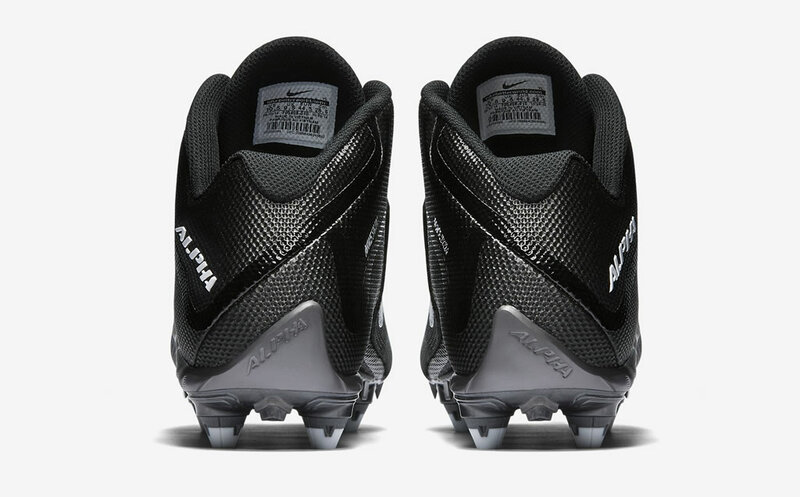 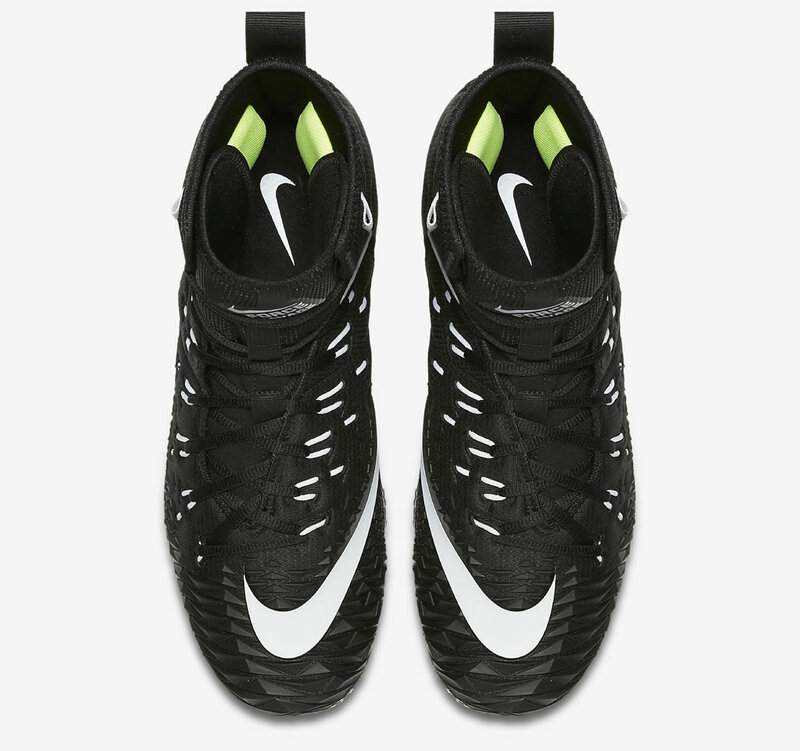 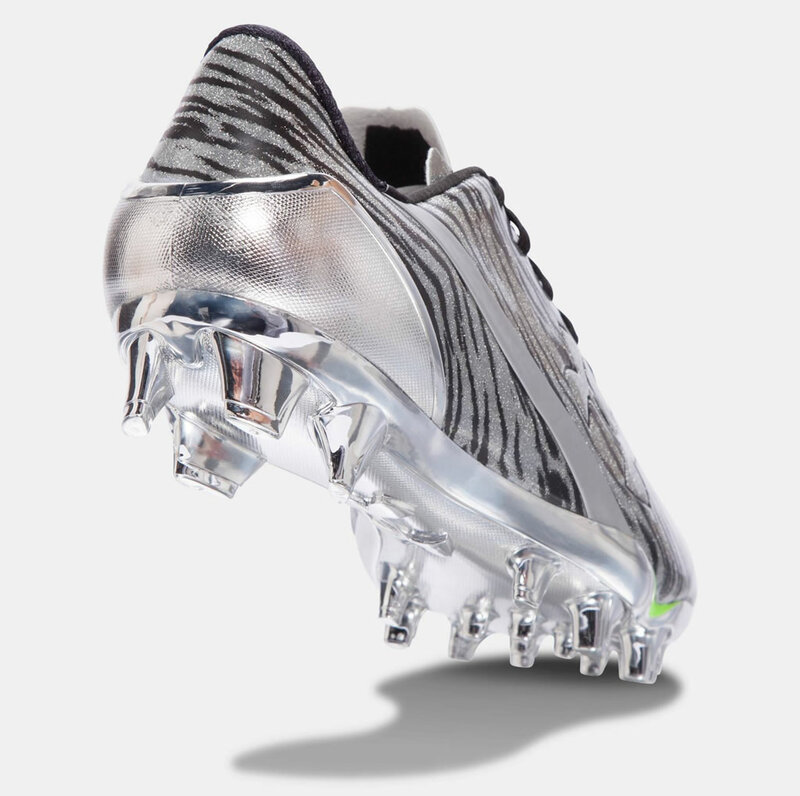 If you’re looking to find the best football cleats for linebackers or running backs, then you’ll definitely want to have a look at the Alpha Pro 2 3/4 D – a high-performance men’s football cleat by Nike that boasts a lightweight synthetic leather upper over a layer of mesh, which will definitely provide the player with untouchable speed, breathability and precise comfort. 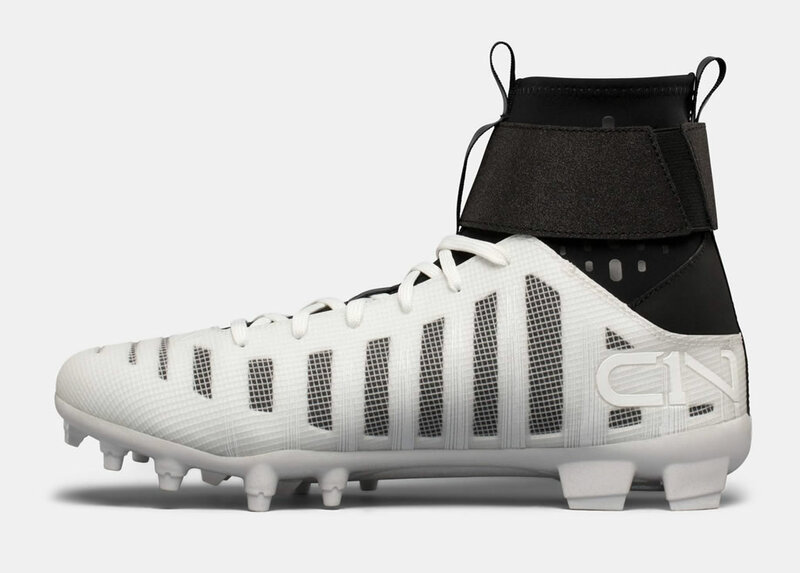 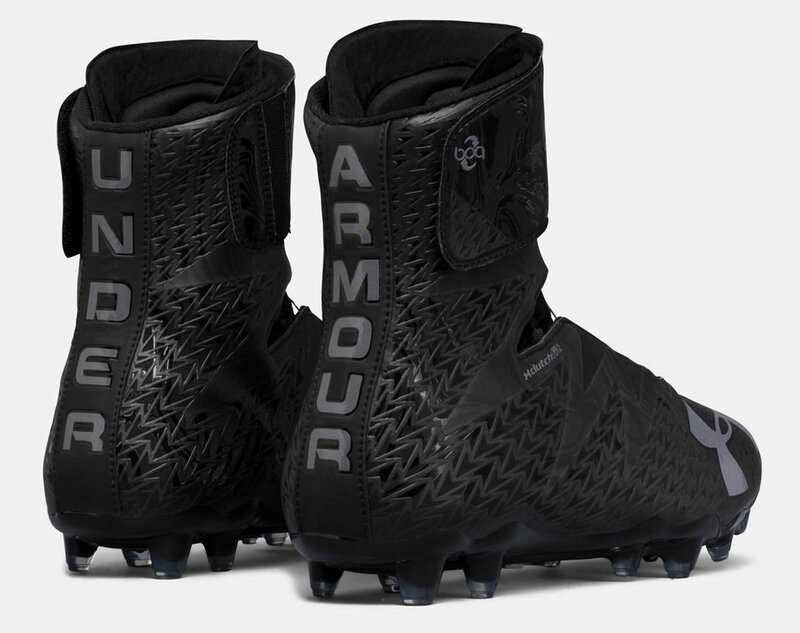 Designed with a with mid-cut silhouette that offers protection and support to the ankles, these cleats impress with seven detachable cleats that allow you to customize your traction according to the field conditions. 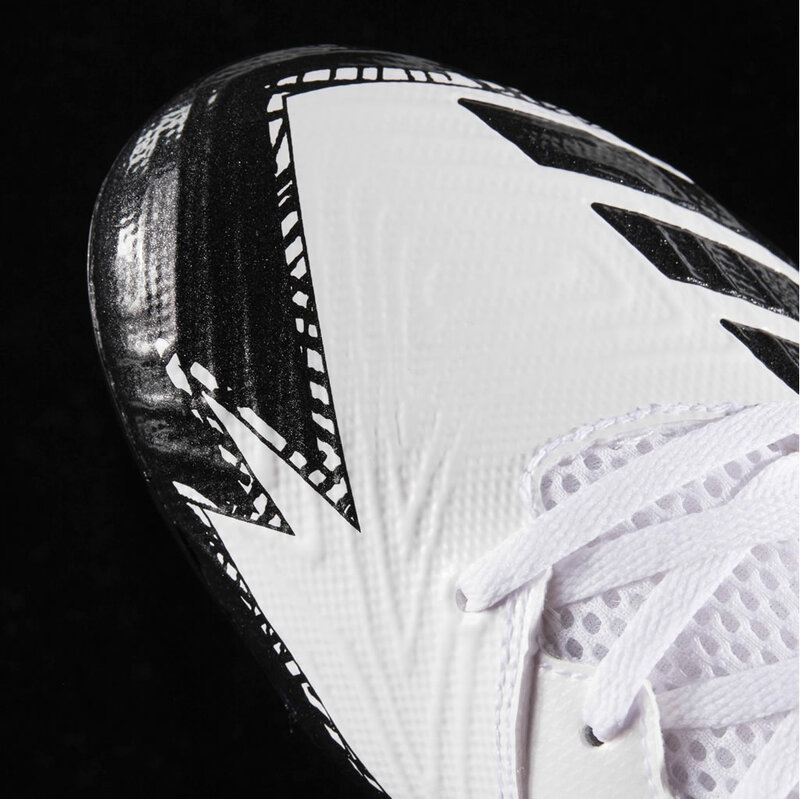 The Flywire technology is present as well, as is the 3/4 Phylon wedge that improves cushioning for extra comfort on impact. 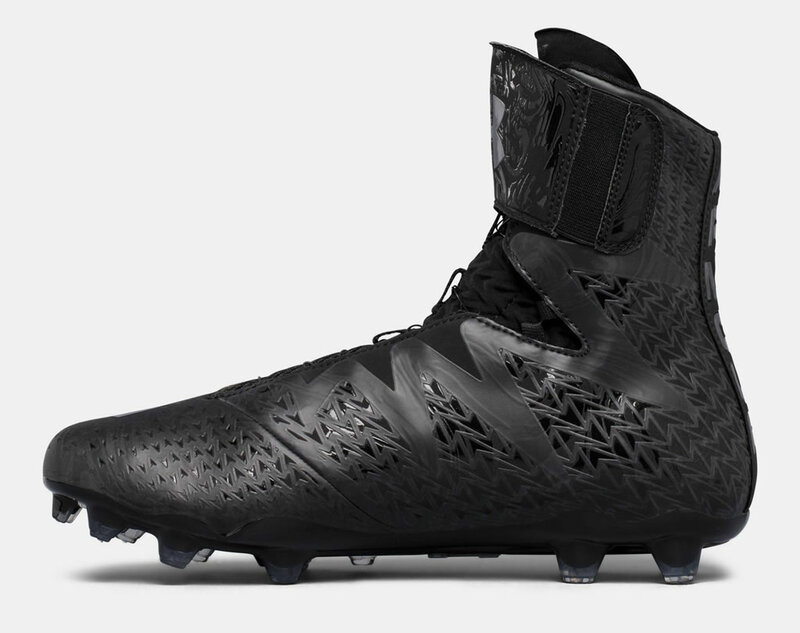 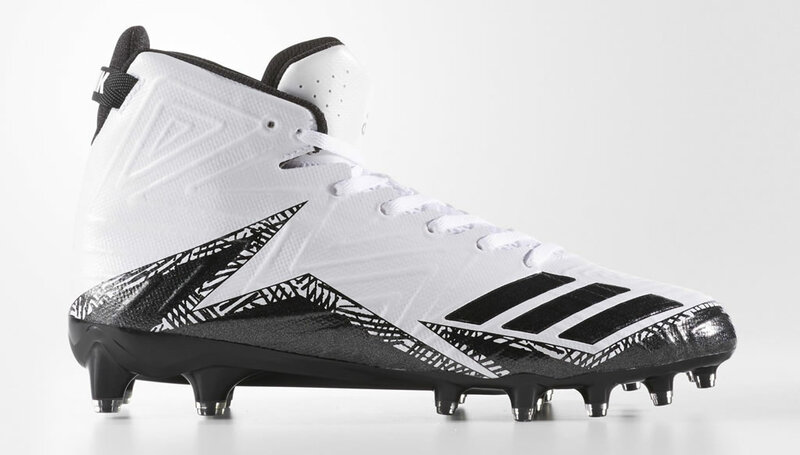 With a design that instantly draws attention, the Freak X Carbon Mid Cleats by Adidas were specially designed for players who are looking to optimize their speed and mobility. 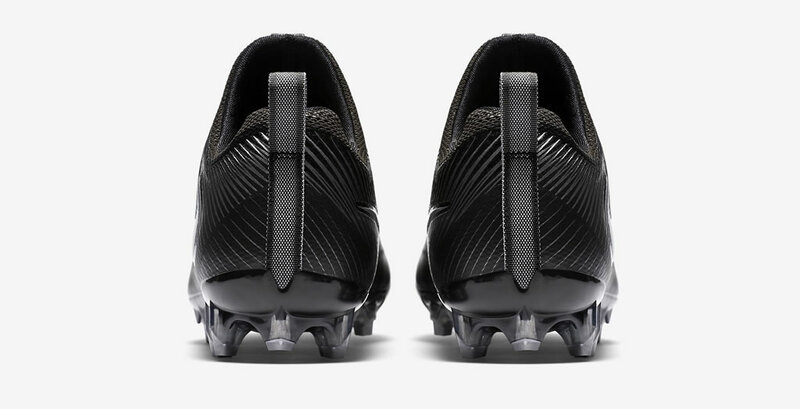 These were achieved mainly with the help of a lightweight upper made with supportive SPRINTSKIN™, while the carbon frame plate, which extends from the forefoot to the heel, also contributes to the same goals. 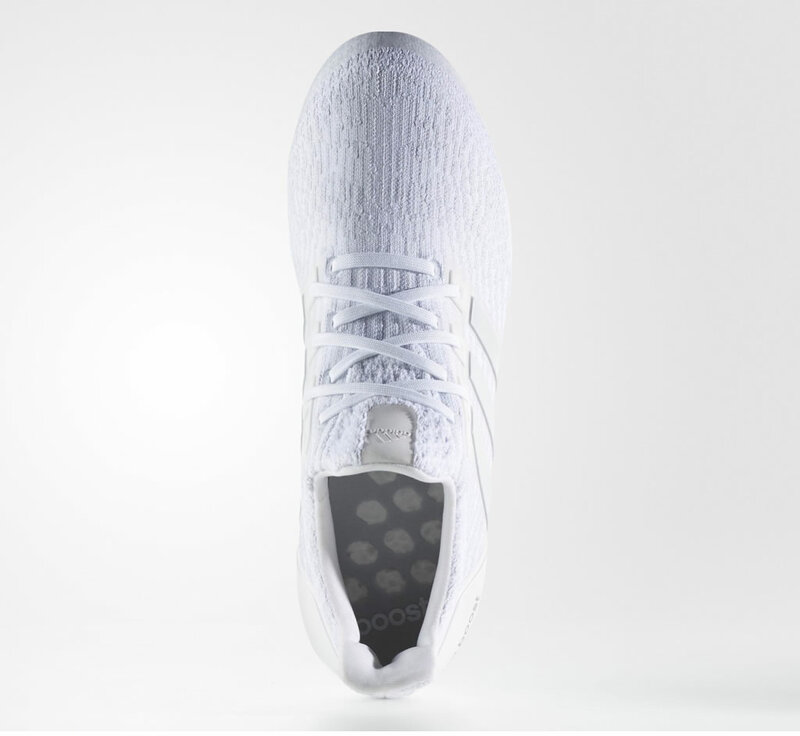 Other highlights include a supportive and breathable mesh lining, a heel cup that locks the foot in place perfectly, and an integrated embroidered LOCKWEB lacing system for zonal support. 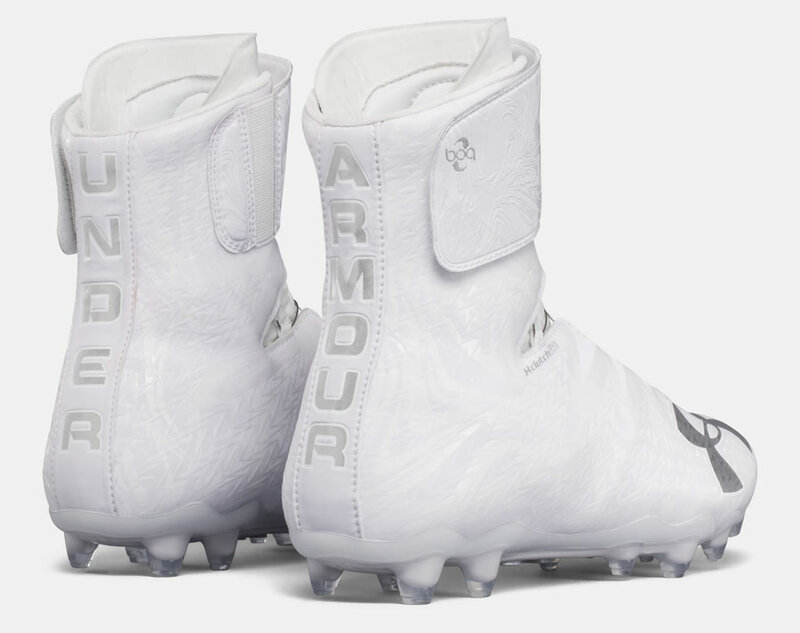 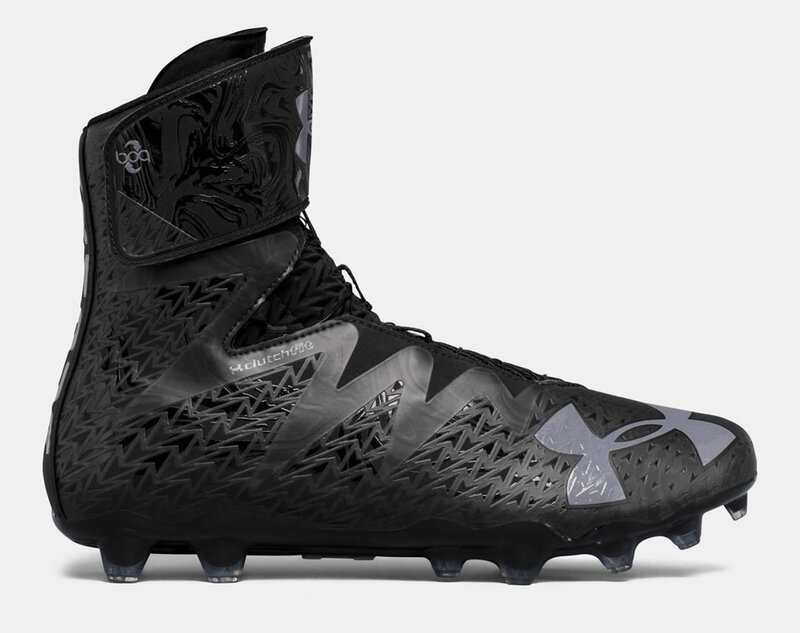 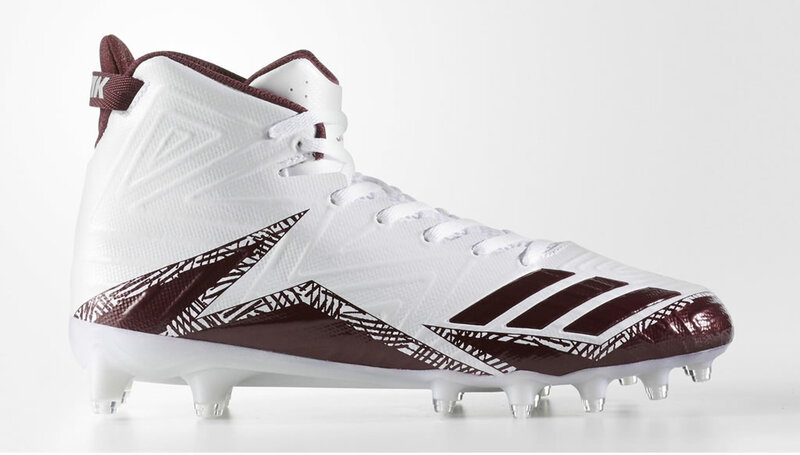 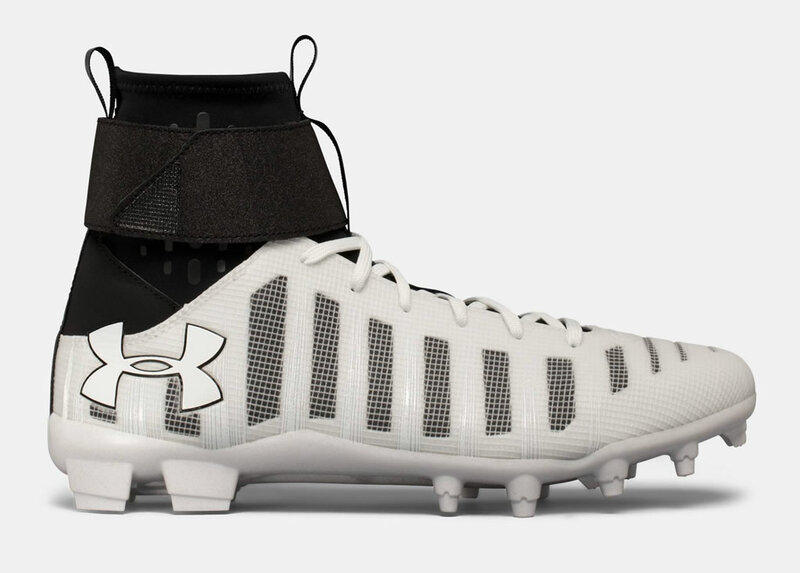 These Under Armour football cleats for men also deserve a spot on our list, as they include a series of great UA technologies that allow them to provide a top-notch performance. 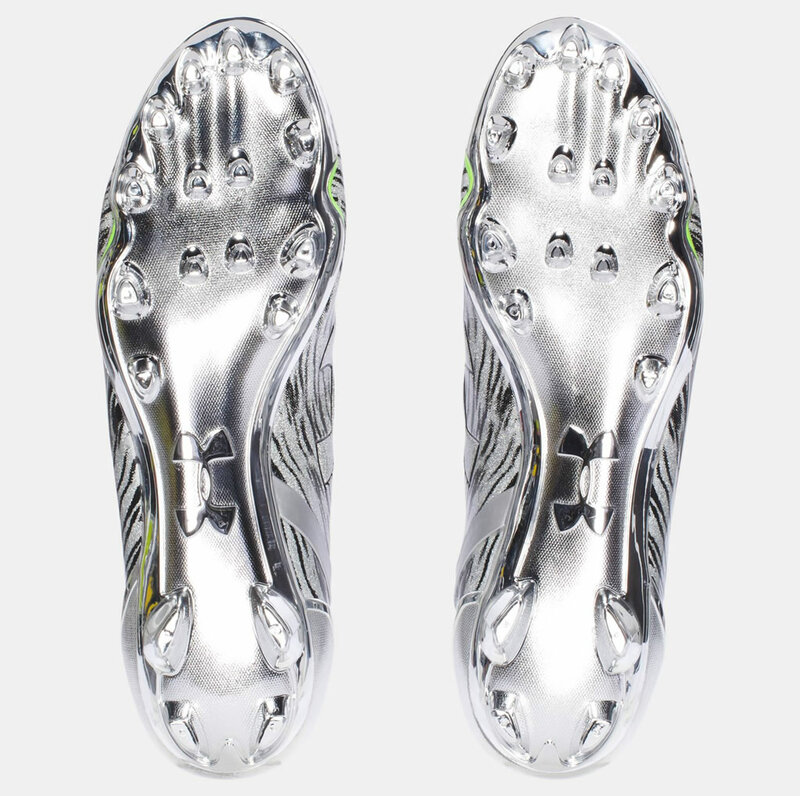 Named UA Spotlight, these football cleats for running backs flaunt an Icy Diamond synthetic upper, as well as a SpeedForm® construction that molds perfectly to the foot in order to guarantee a nice feel. 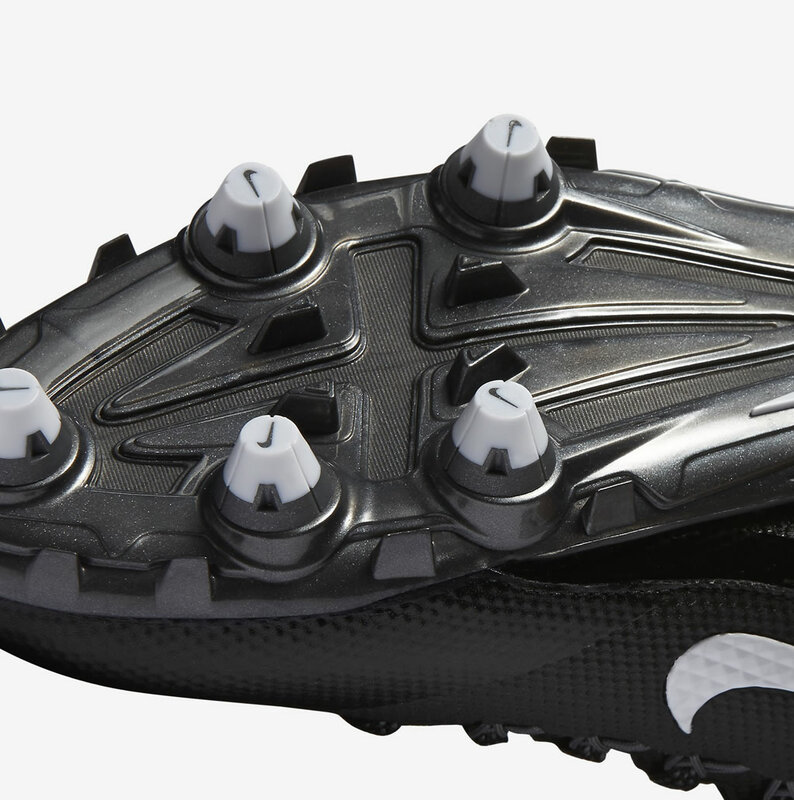 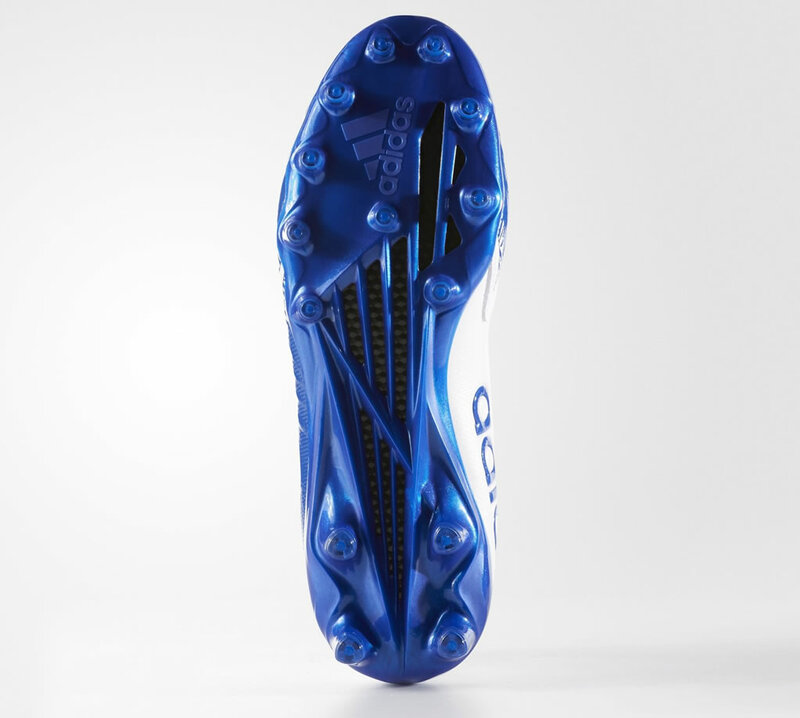 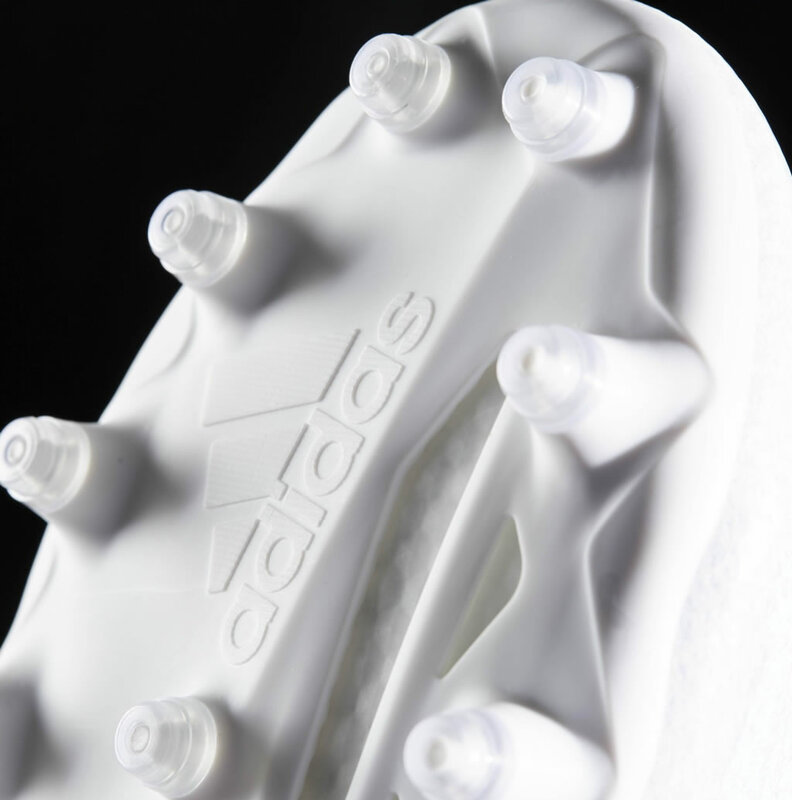 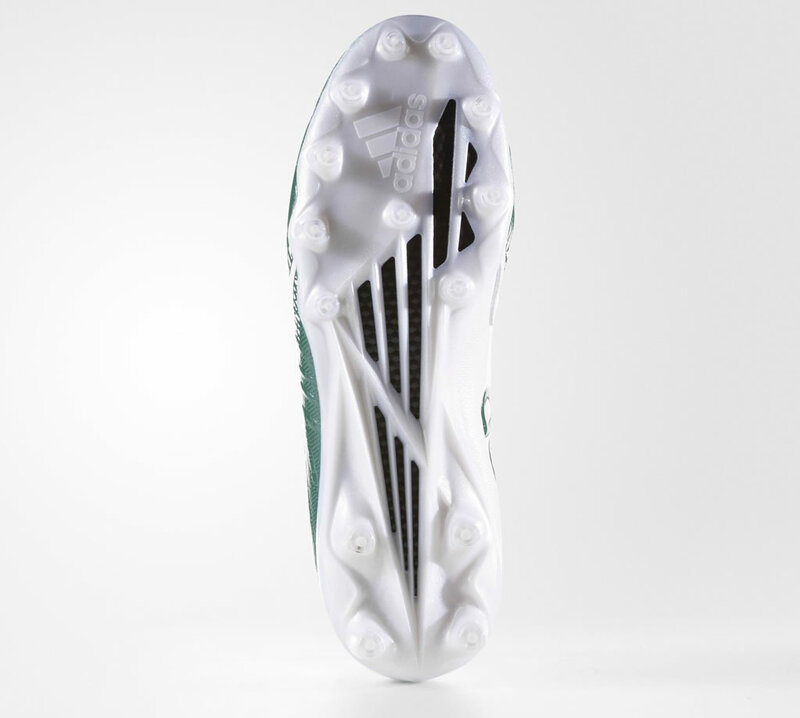 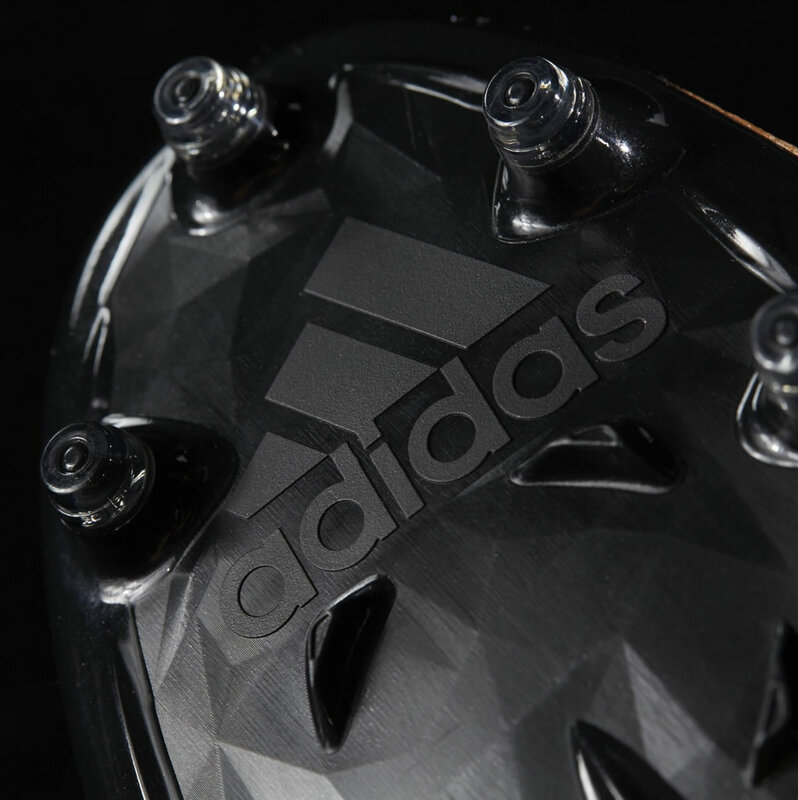 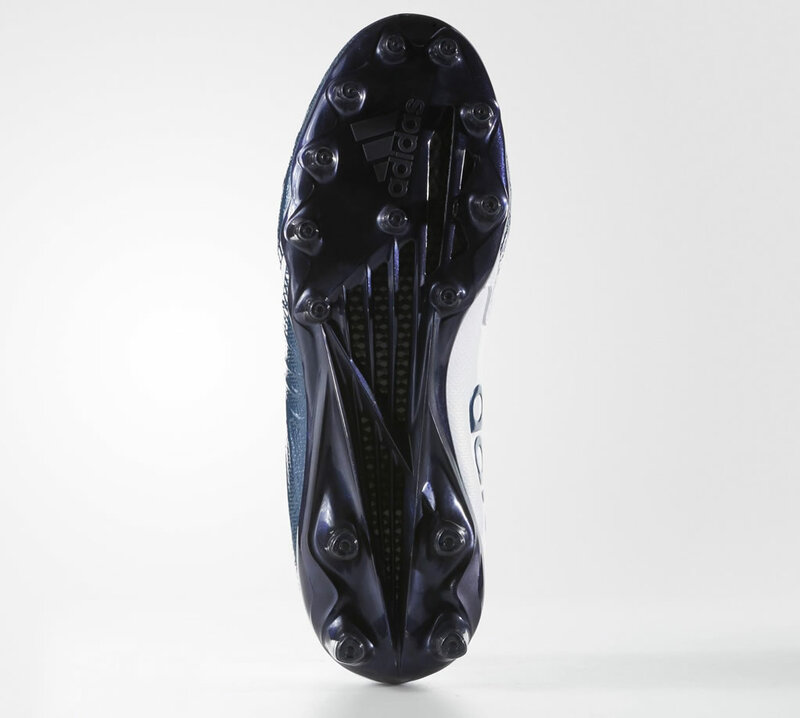 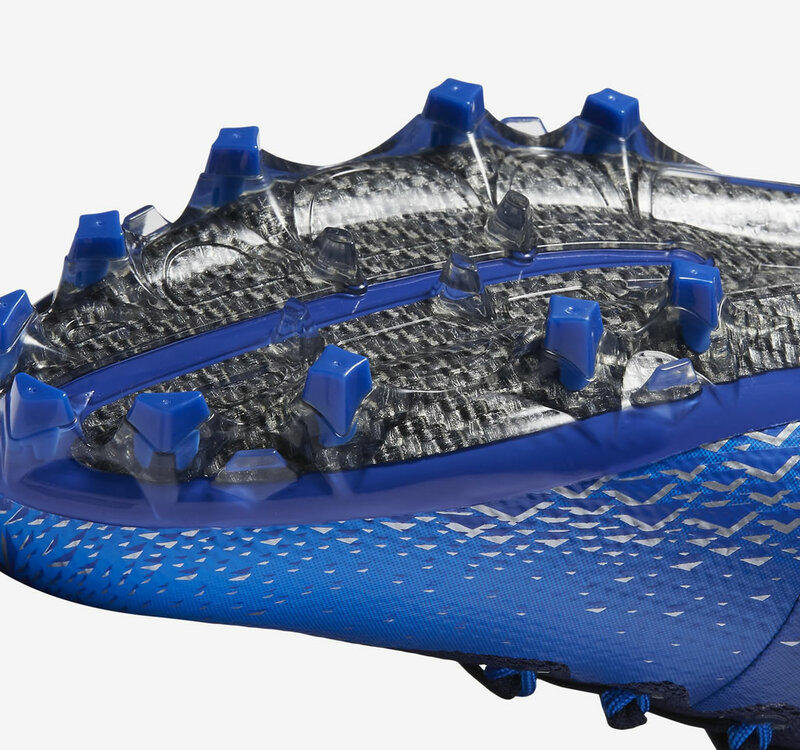 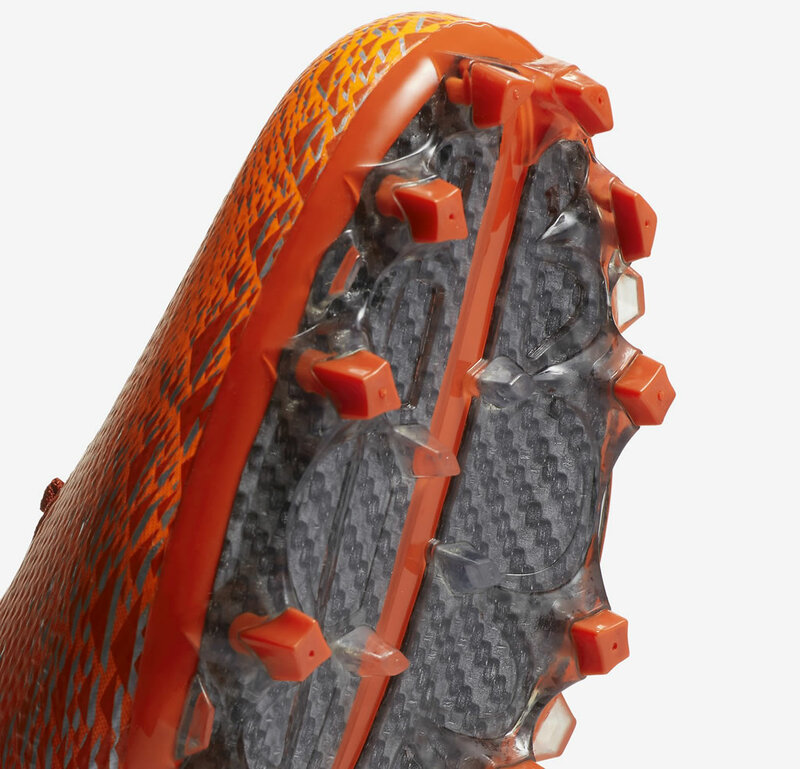 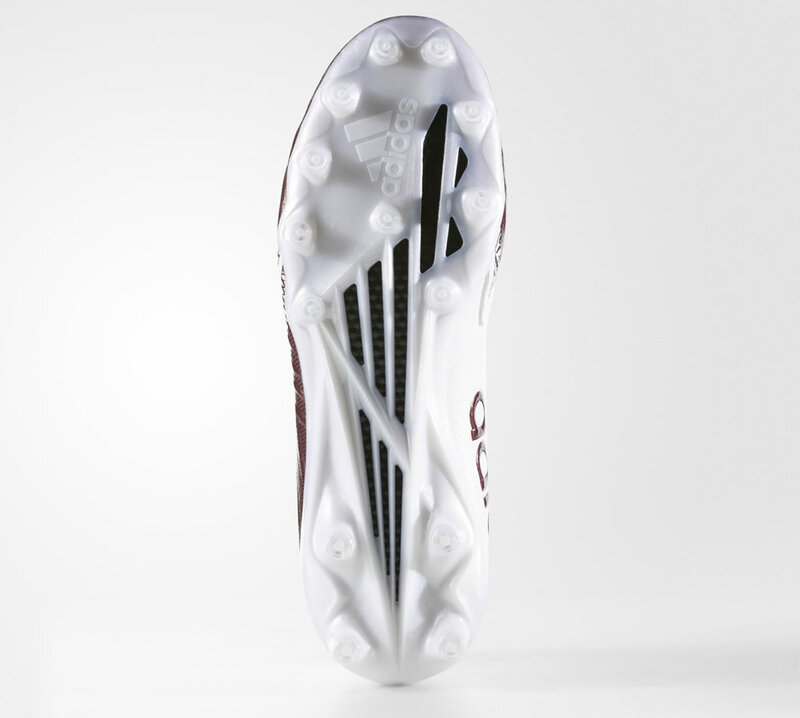 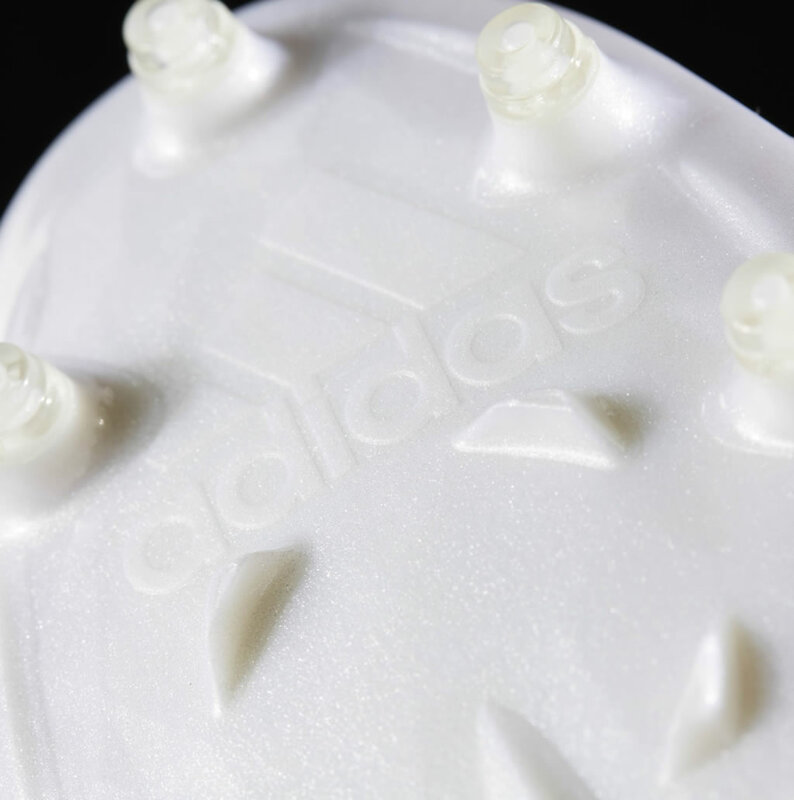 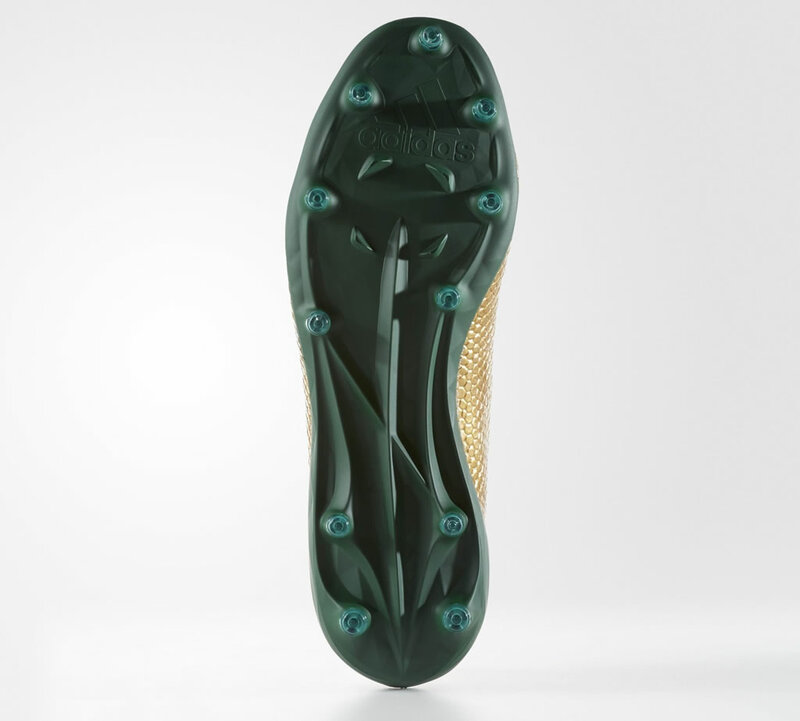 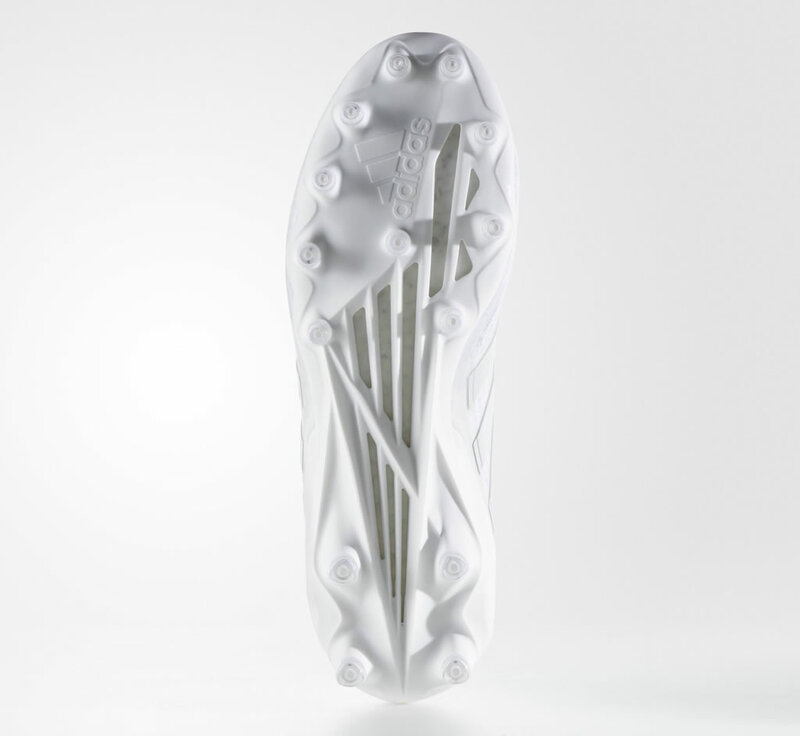 Also, the cleats deliver a locked in feel thanks to their impressive Pebax® external heel counter. 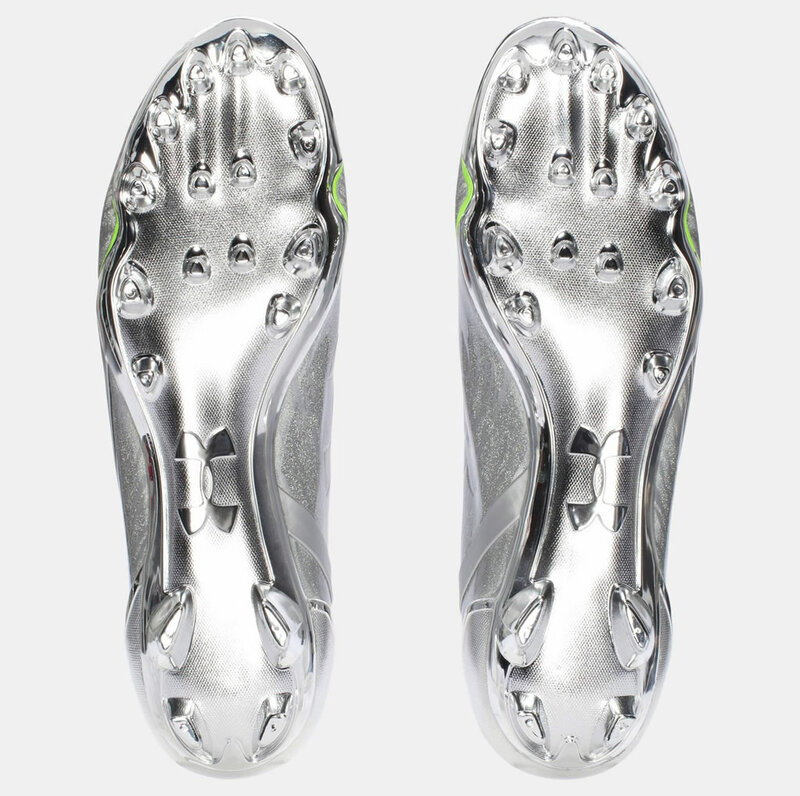 We should also mention the Icy Chromed-out TPU cleat plate and the V56 technology in the forefoot that helps limit toe hyperextension. 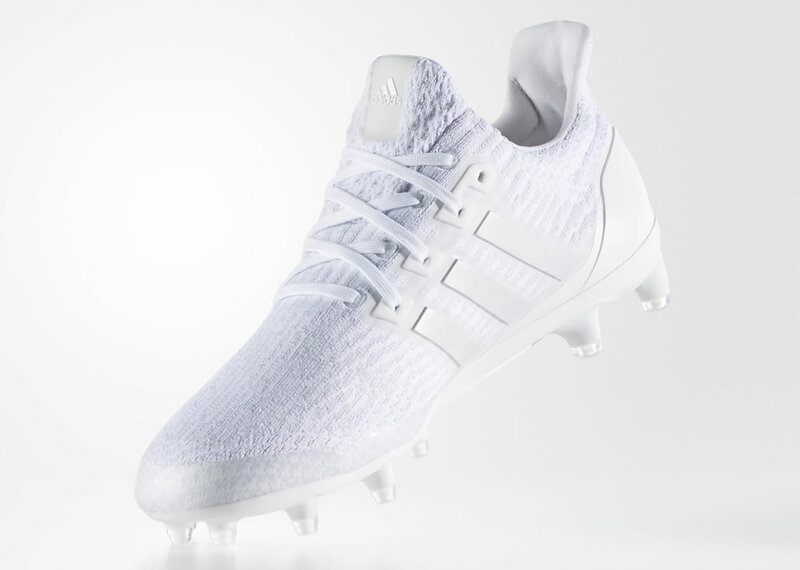 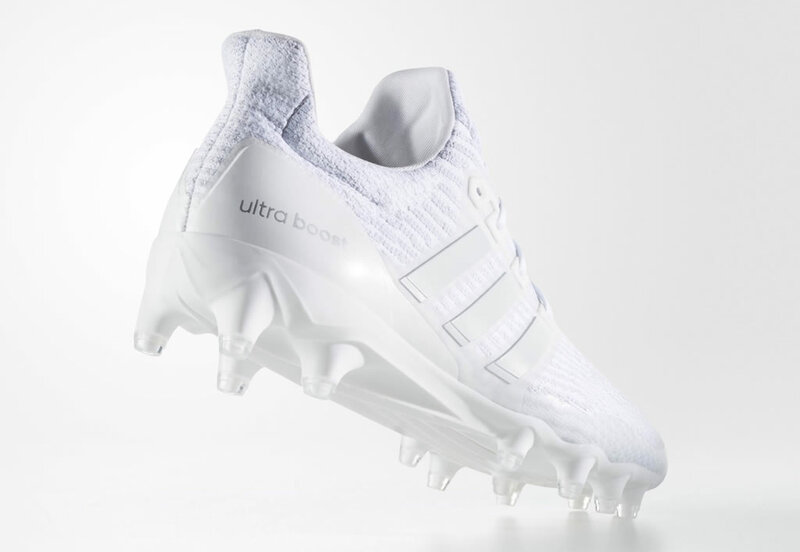 Boasting a classic look, the Adidas Ultraboost football cleats are available in Black and White, and they incorporate the brand’s Boost™ Technology that offers amazing cushioning while providing the consumer with breakaway speed and precise comfort. 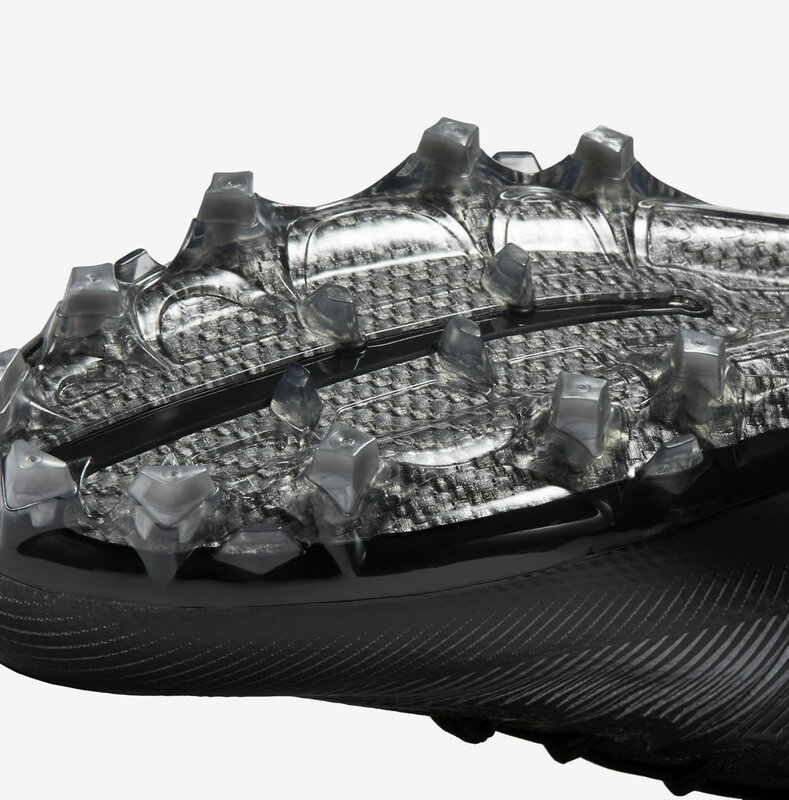 Then there’s RAZORFRAME plate with strategically placed SPRINTSTUDS for a better control, and the welded midfoot cage, which enhances the biomechanics of movement. 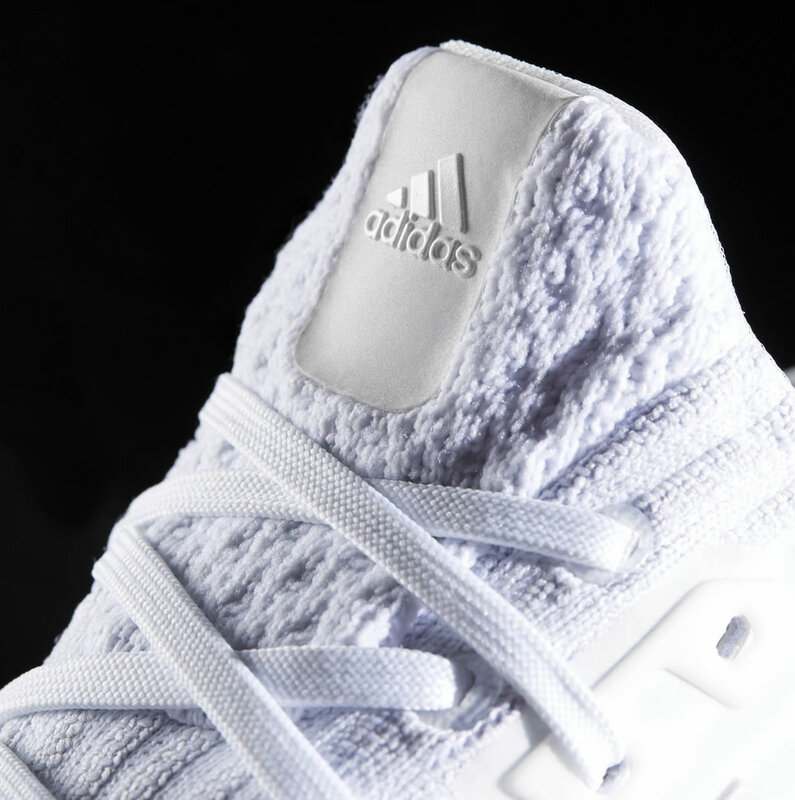 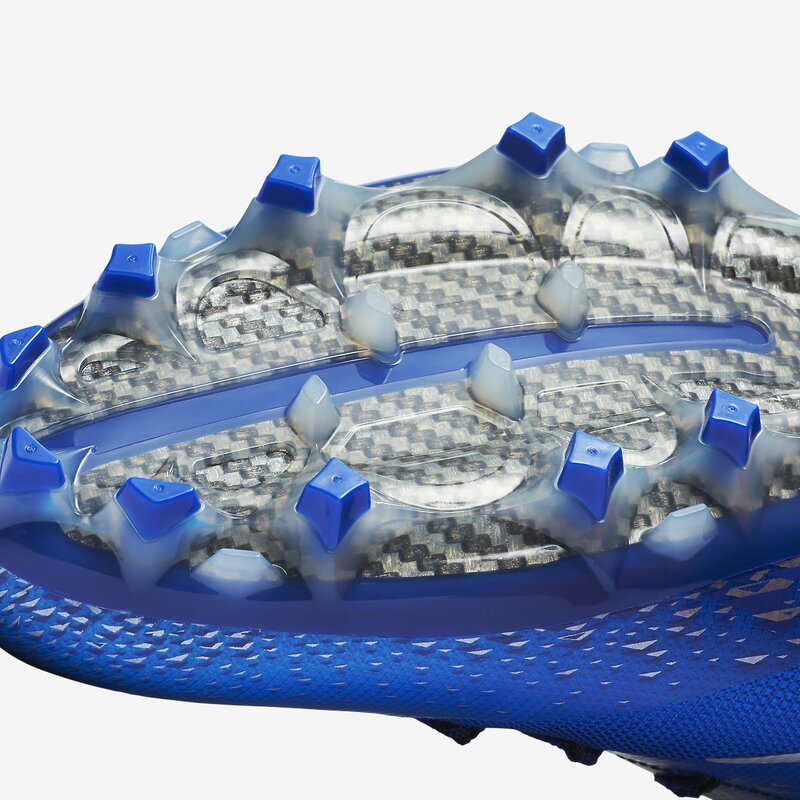 As for the ULTRABOOST heel counter, it centers the foot to ensure support during acceleration and cutting. 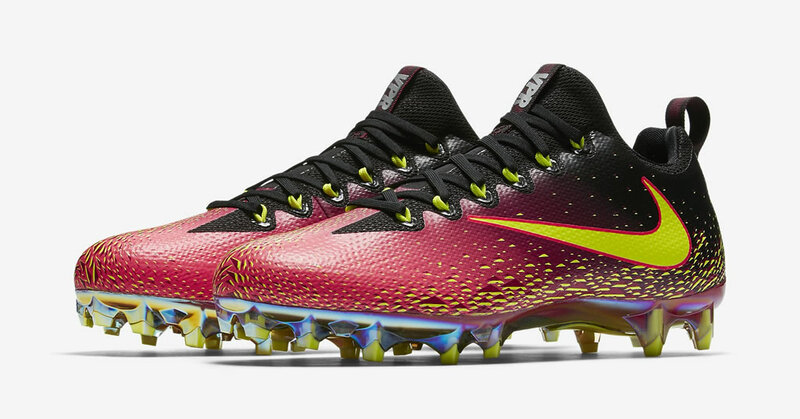 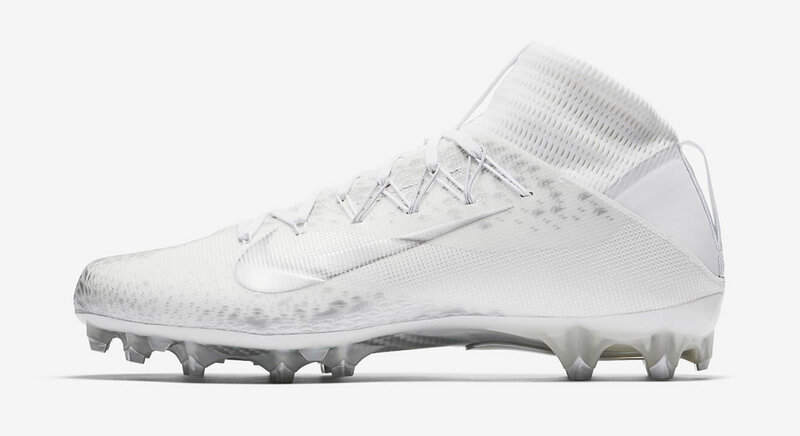 The Vapor Untouchable 2 by Nike is another lightweight pair of football cleats that has plenty of excellent features. 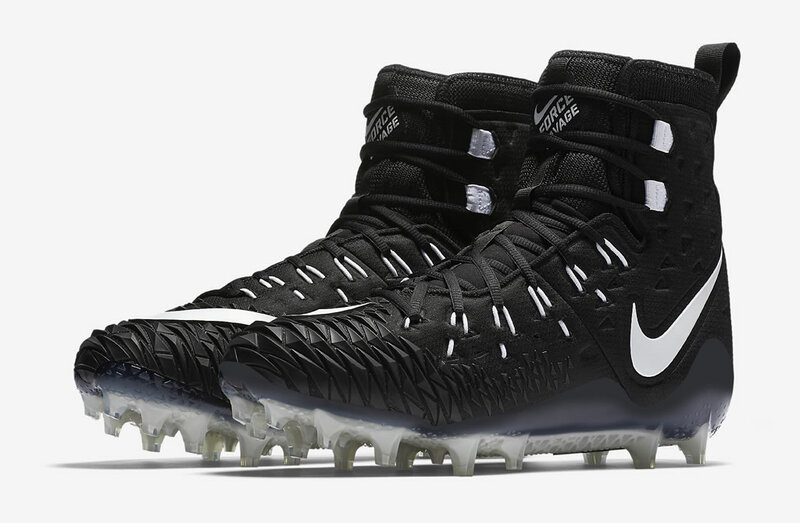 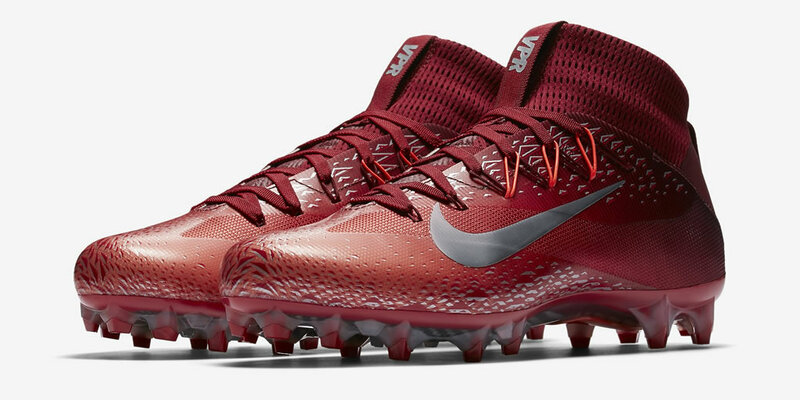 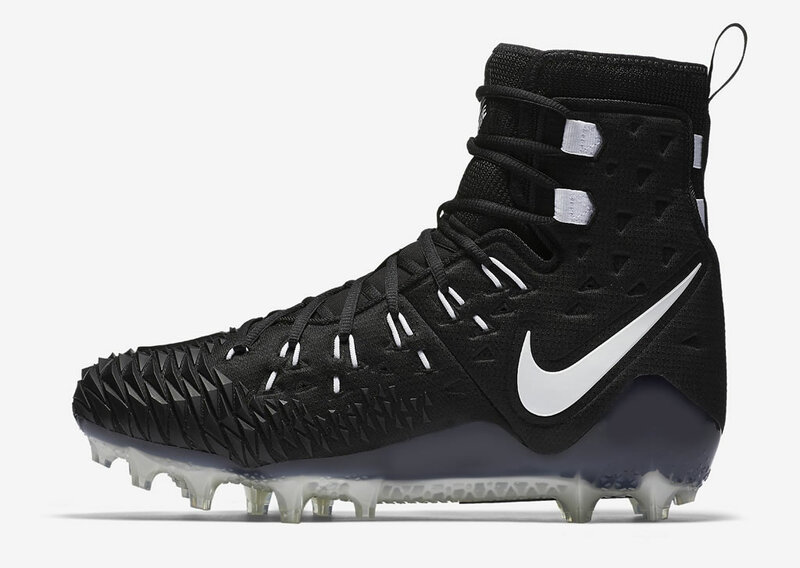 Available in a plethora of colorways, these Nike football cleats for skill players feature a Flyweave construction for an adaptive fit, as well as Flywire cables that wrap the midfoot and integrate beautifully with the laces for support. 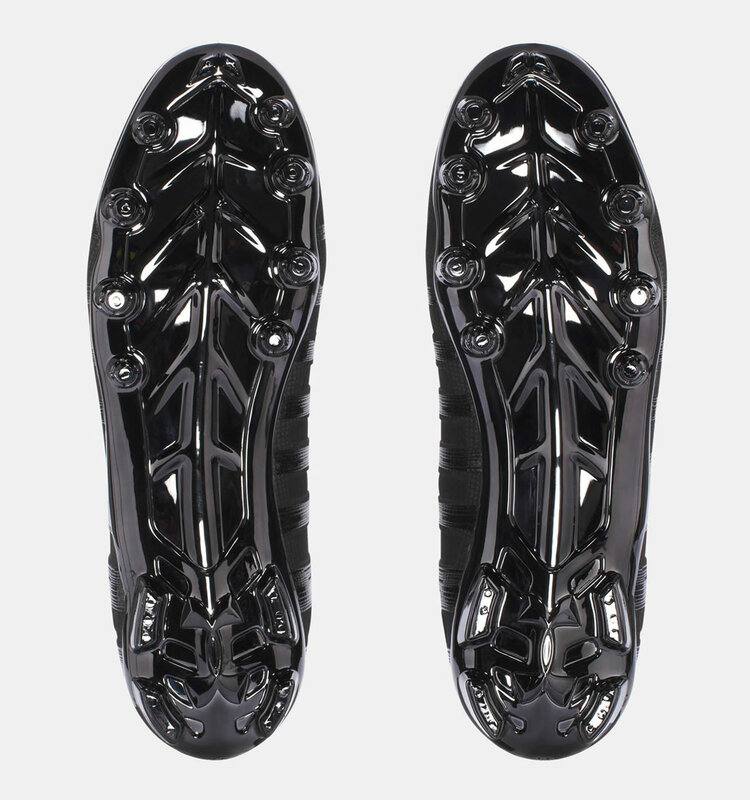 We should also mention the carbon fiber plate that offers stability and flexibility, and the innovative cleat geometry, which optimizes traction for quick changes in direction. 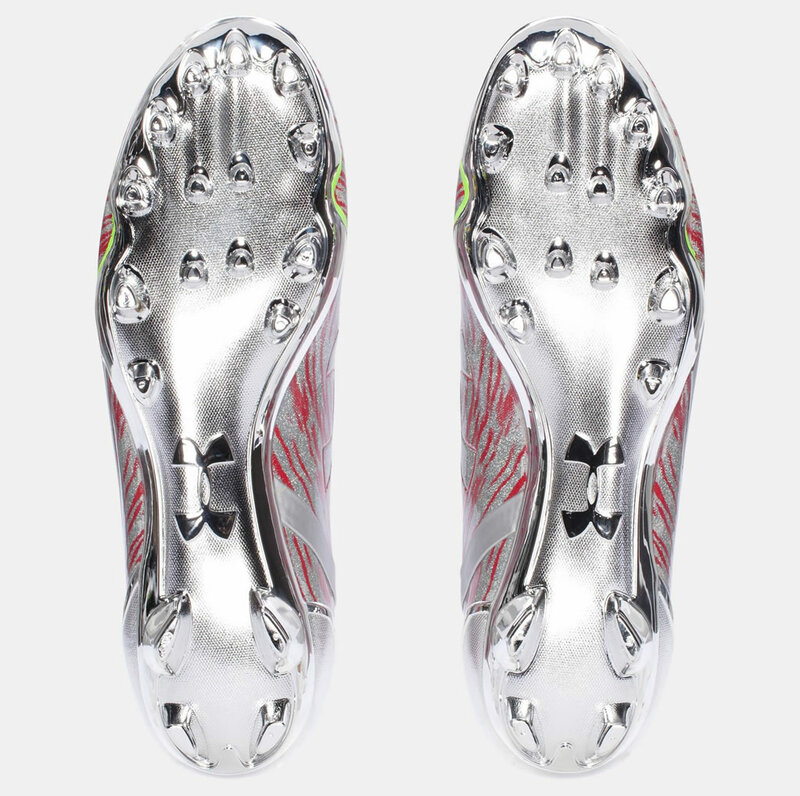 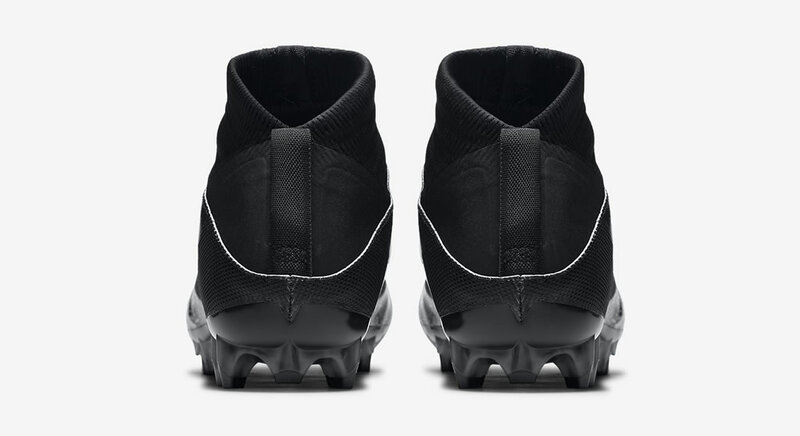 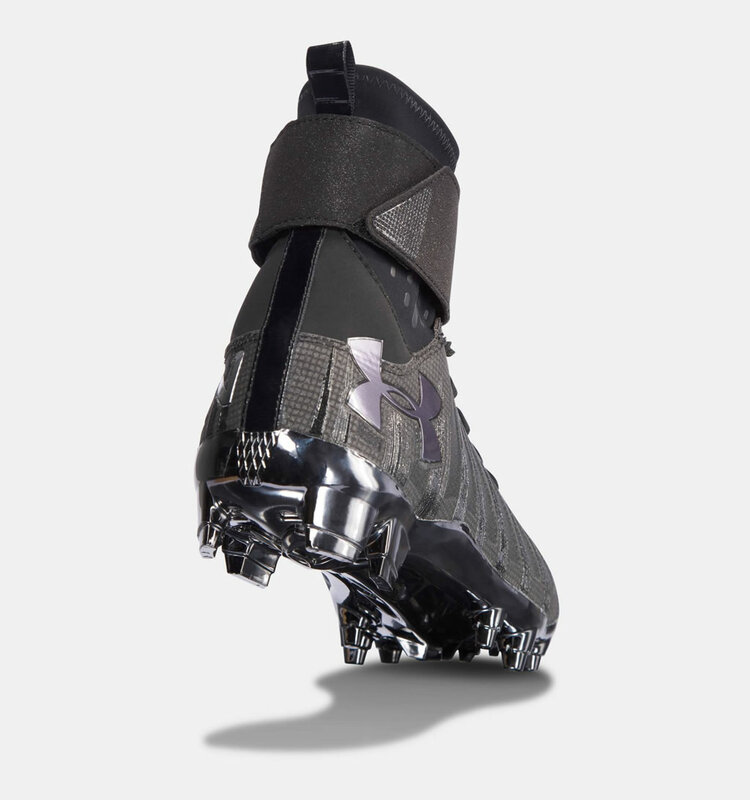 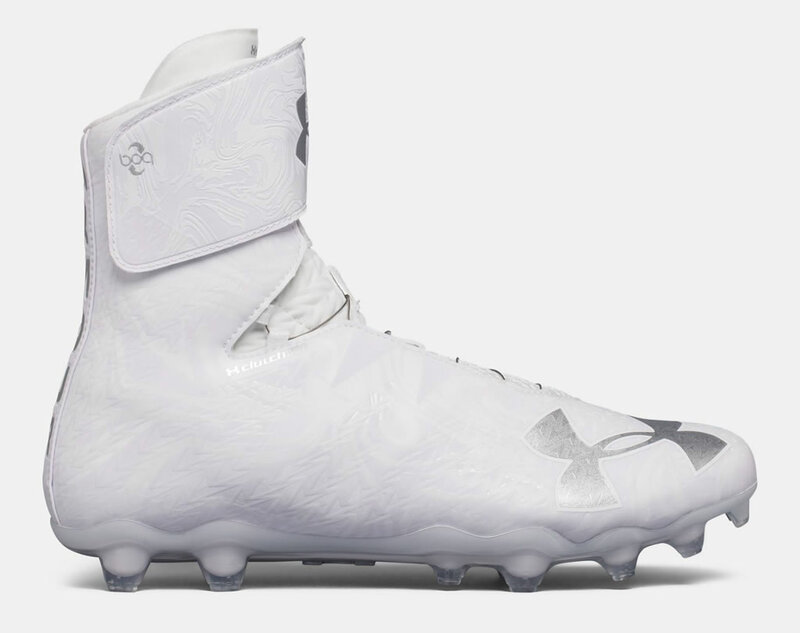 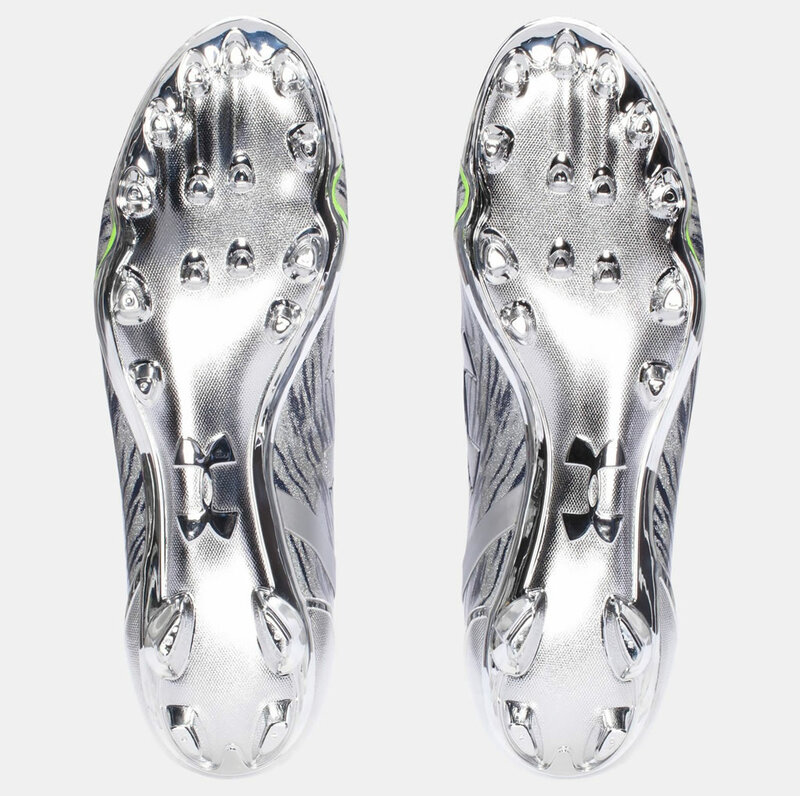 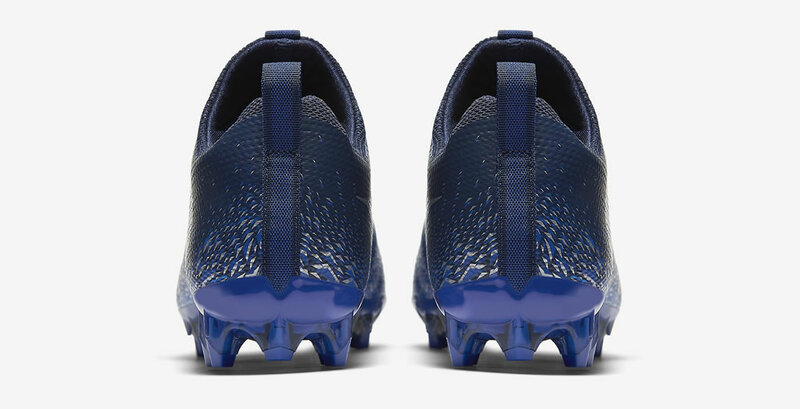 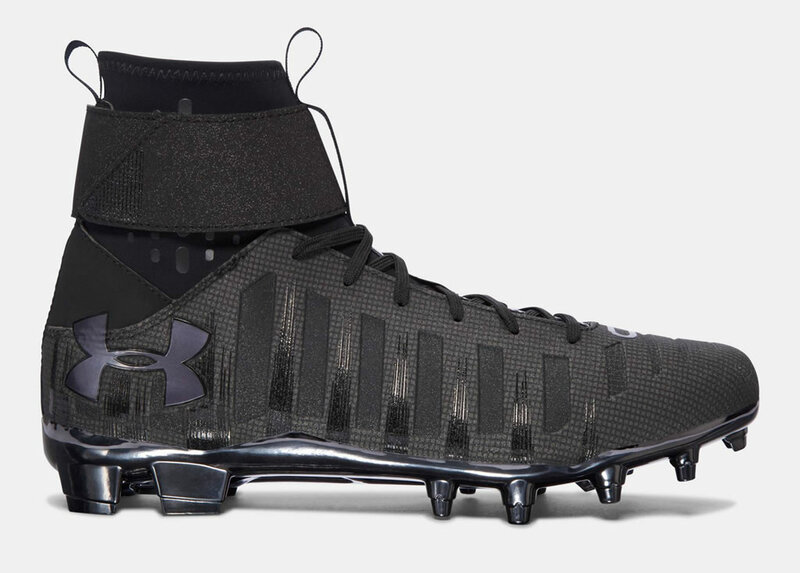 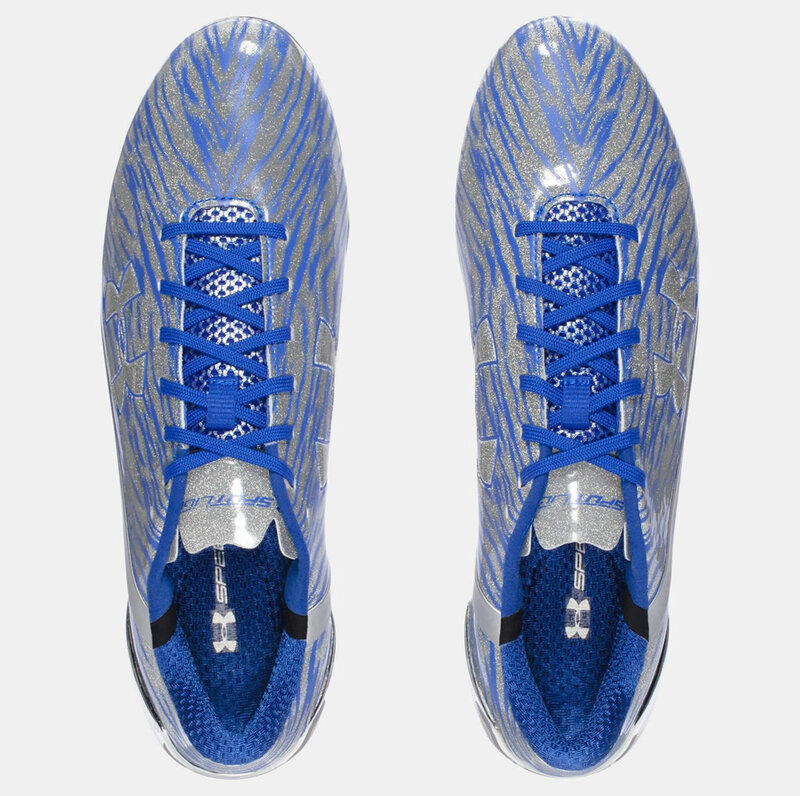 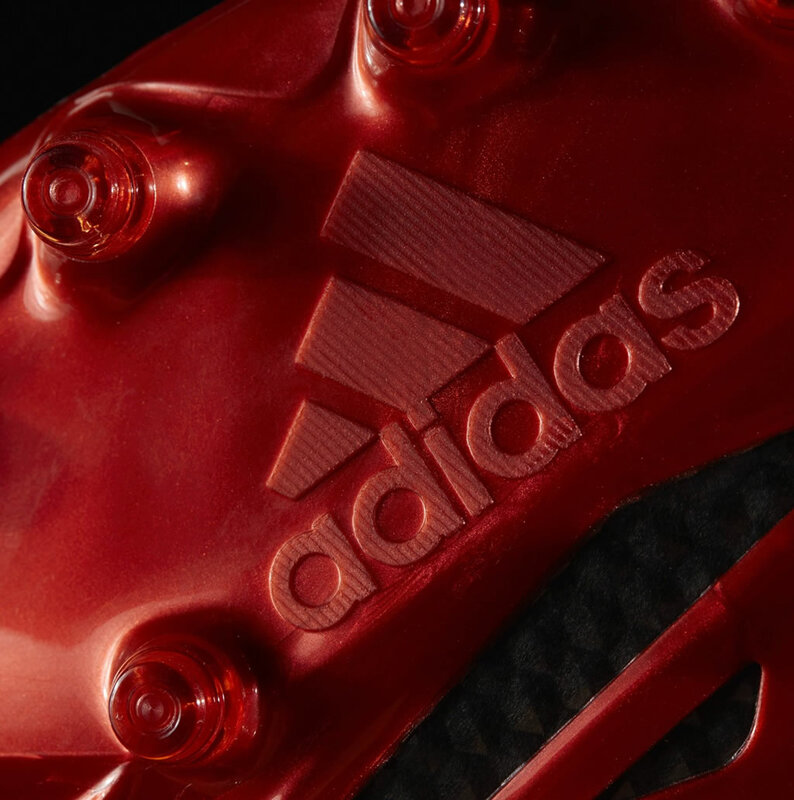 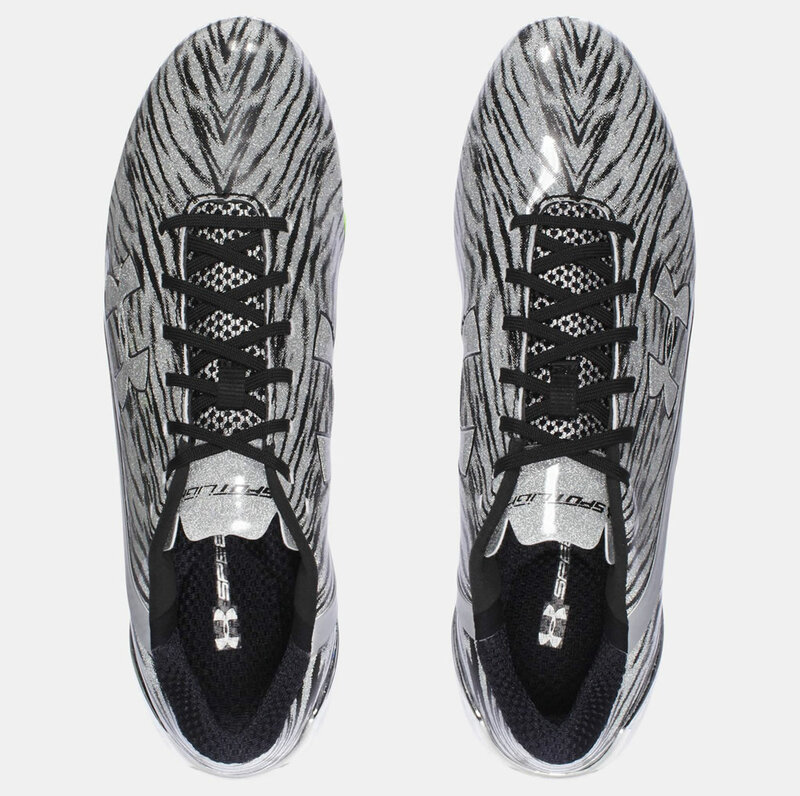 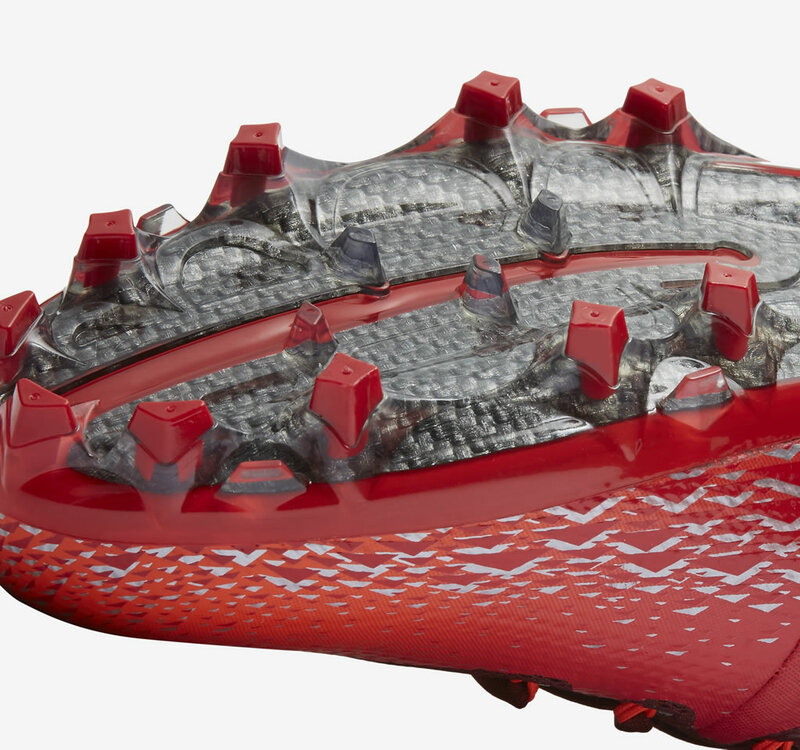 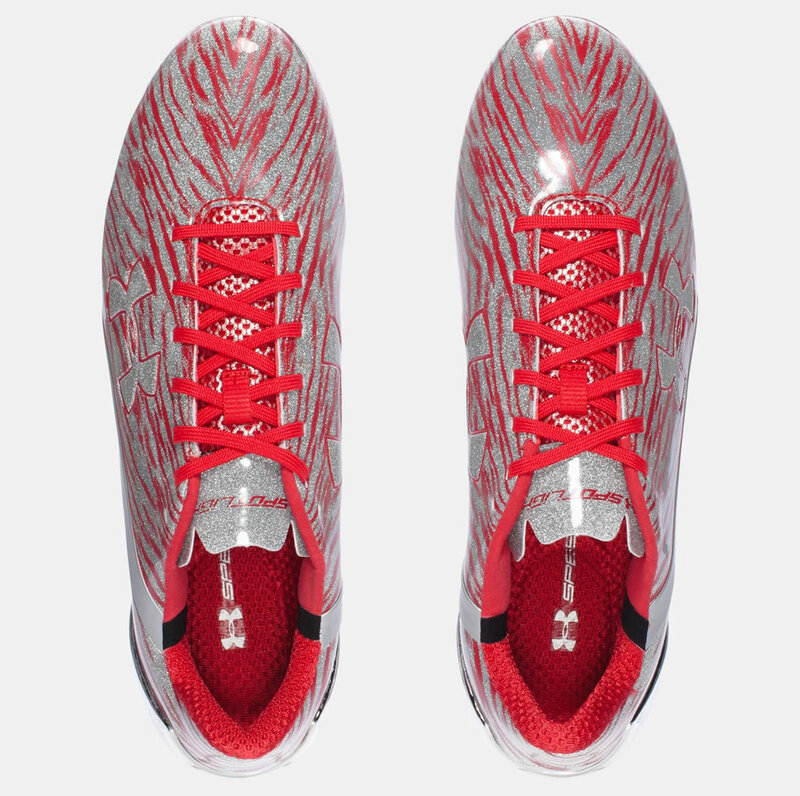 Another great pair of cleats is the Highlight MC 2.0 BOA™ from Under Armour. 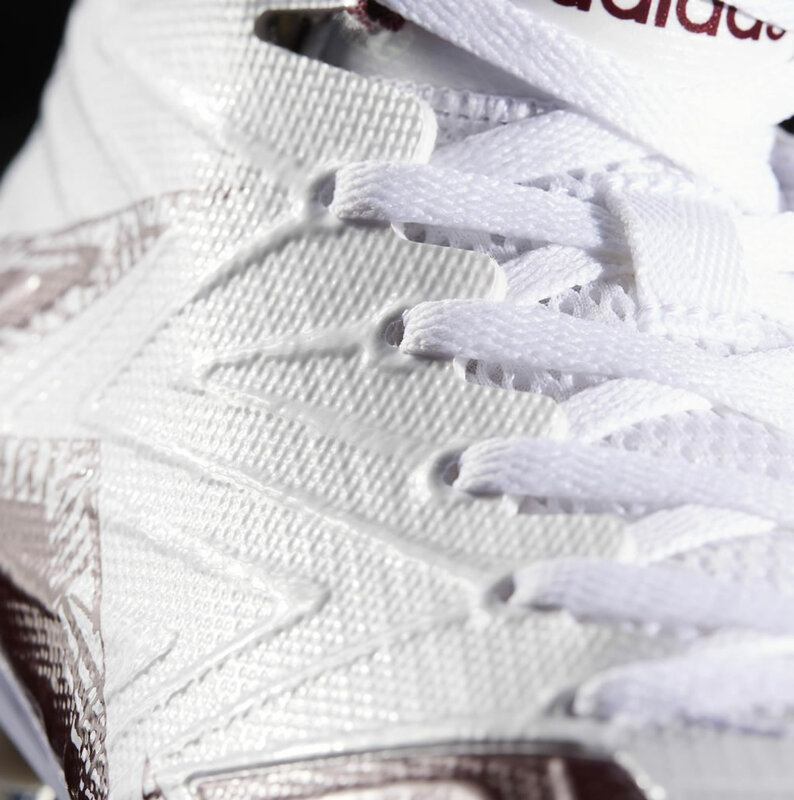 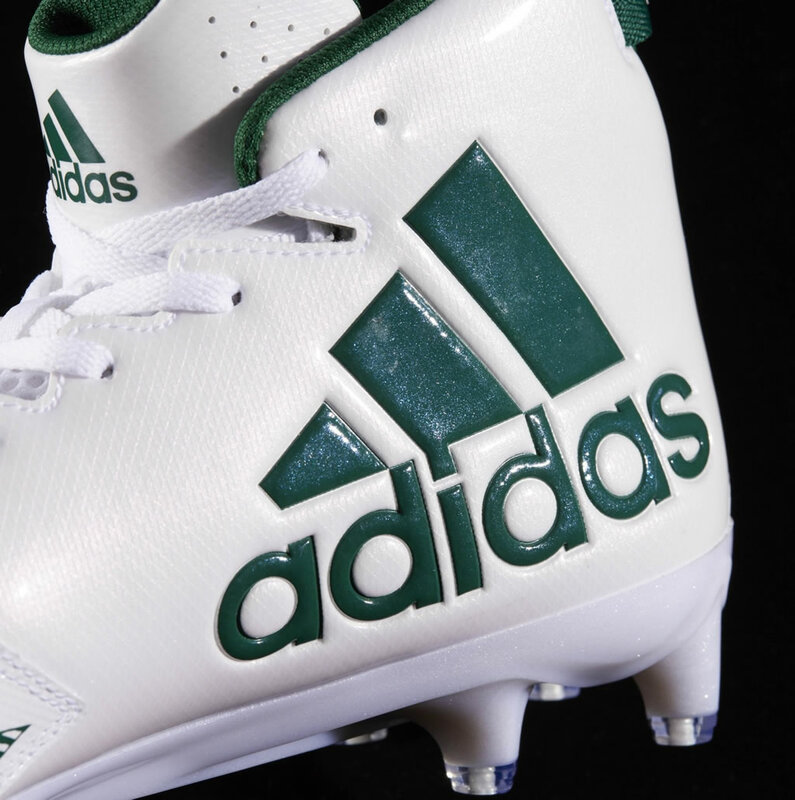 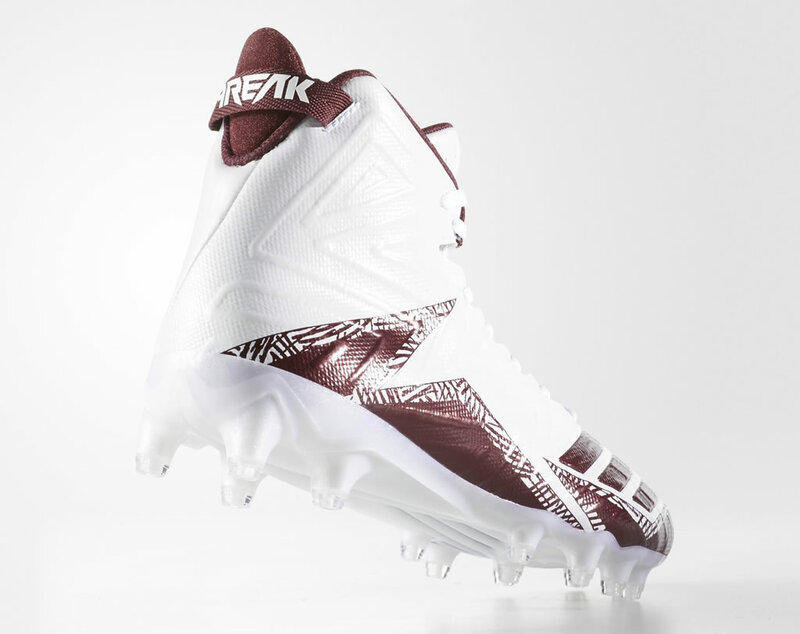 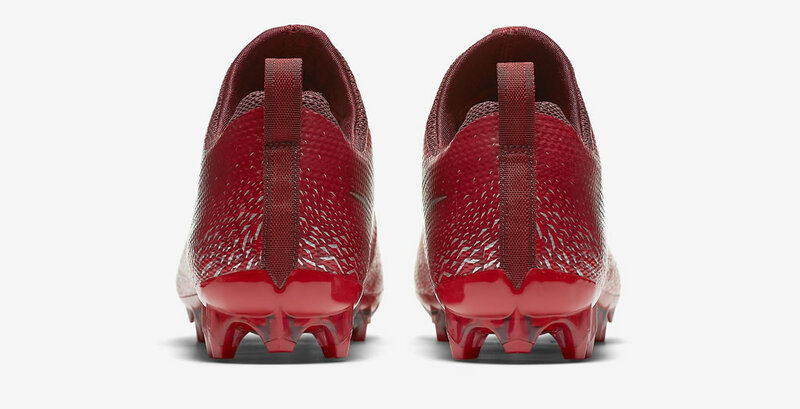 What makes these high–top football cleats stand out is the fact that they incorporate a customizable BOA™ closure system, which provides adjustable support and stability. 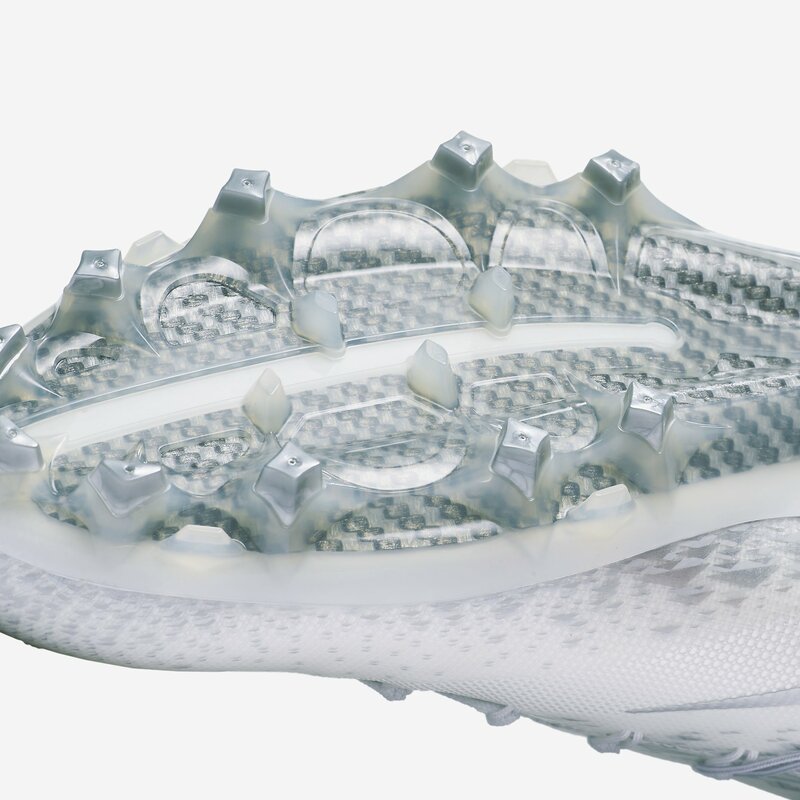 The V56 technology in the forefoot and the 3D molded MPZ® tongue are also important additions, while the UA PlasmaX plate supports a natural range of motion and offers improved traction. 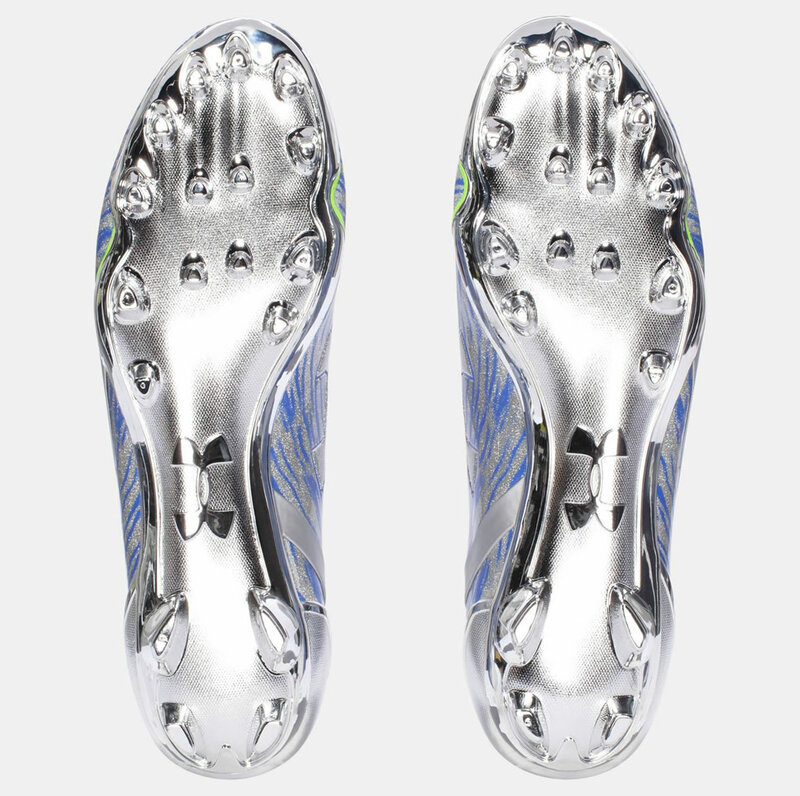 Inspired by the foot’s natural muscle structure, the Molded 4D Foam® footbed eliminates slippage while reducing cleat pressure, while UA ClutchFit® upper guarantees much-needed support. 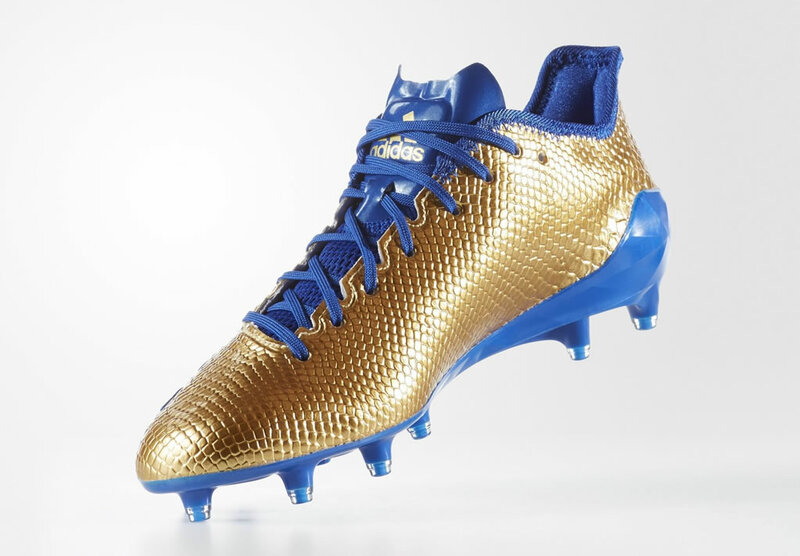 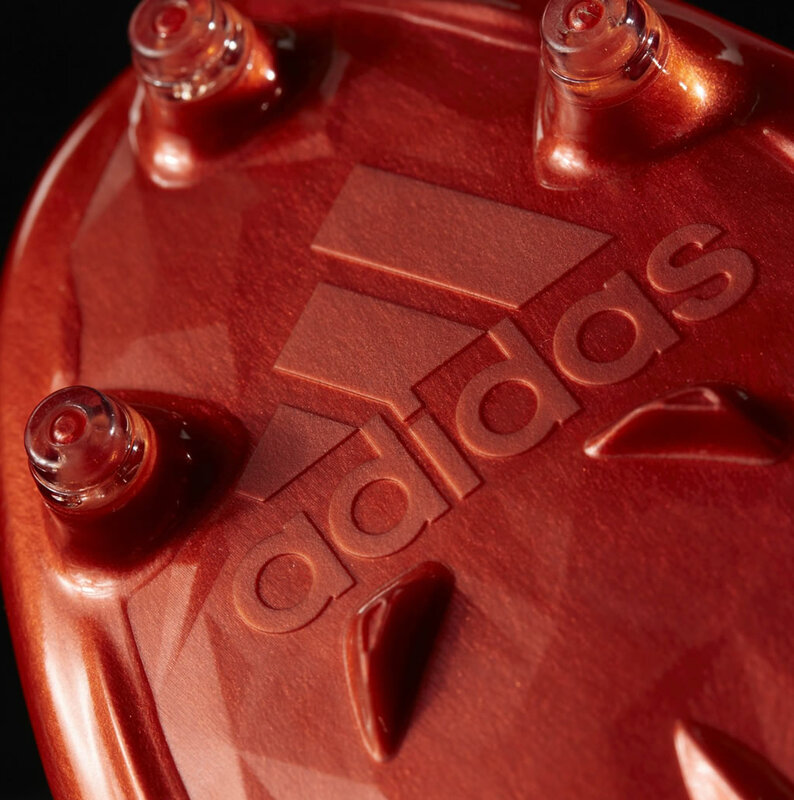 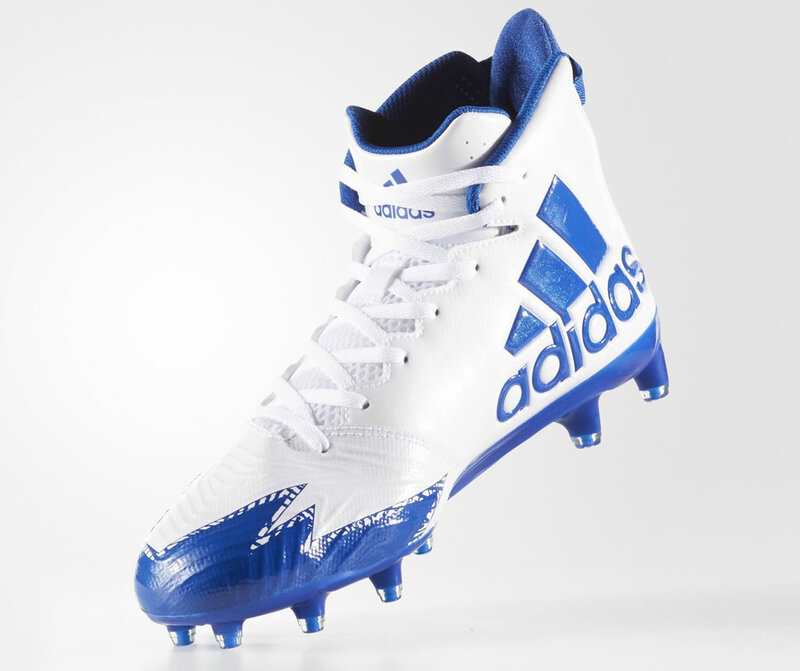 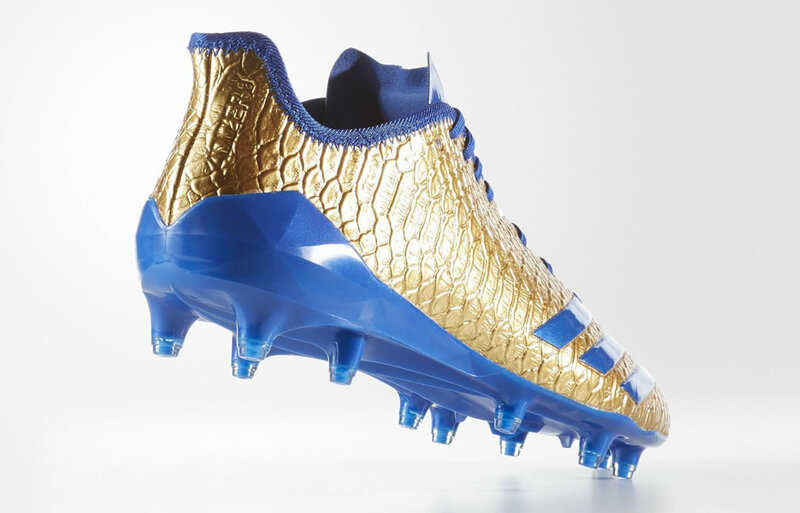 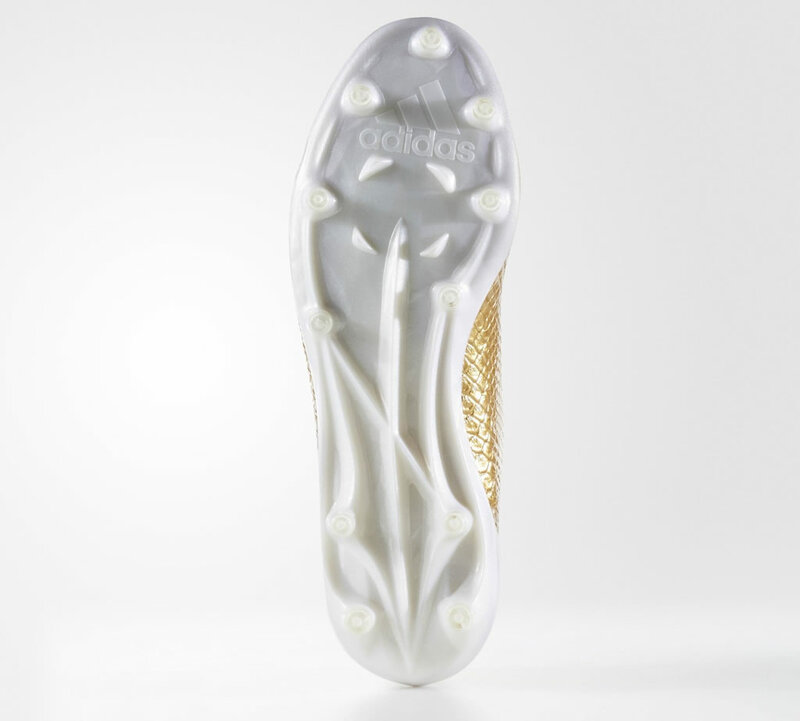 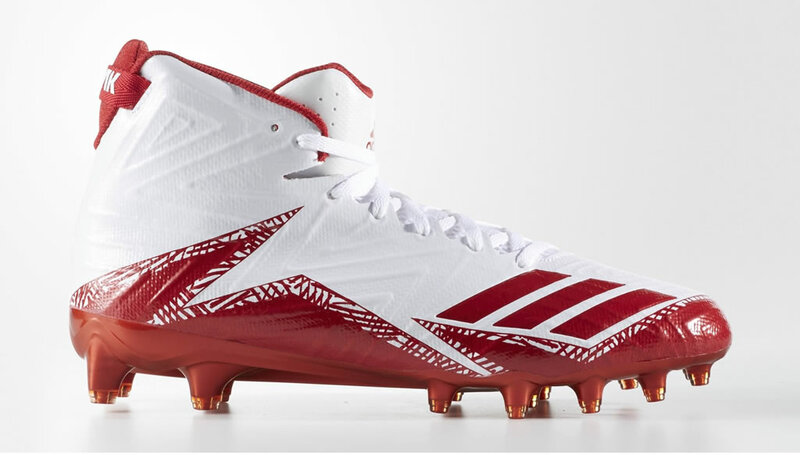 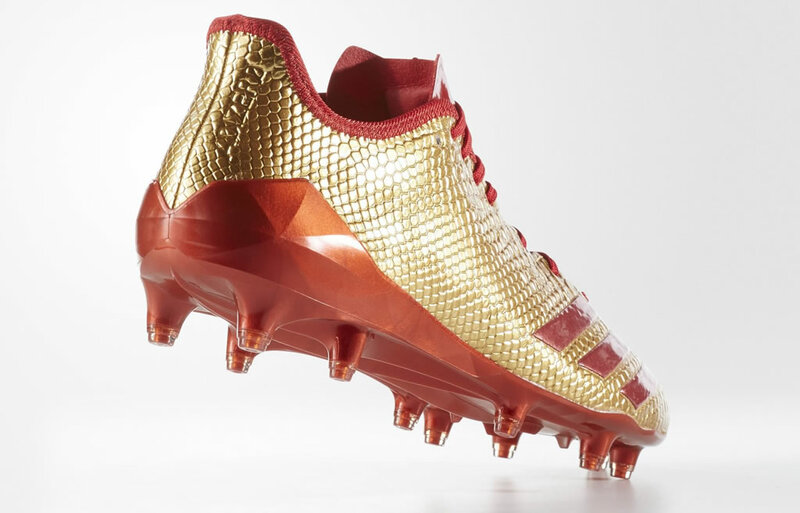 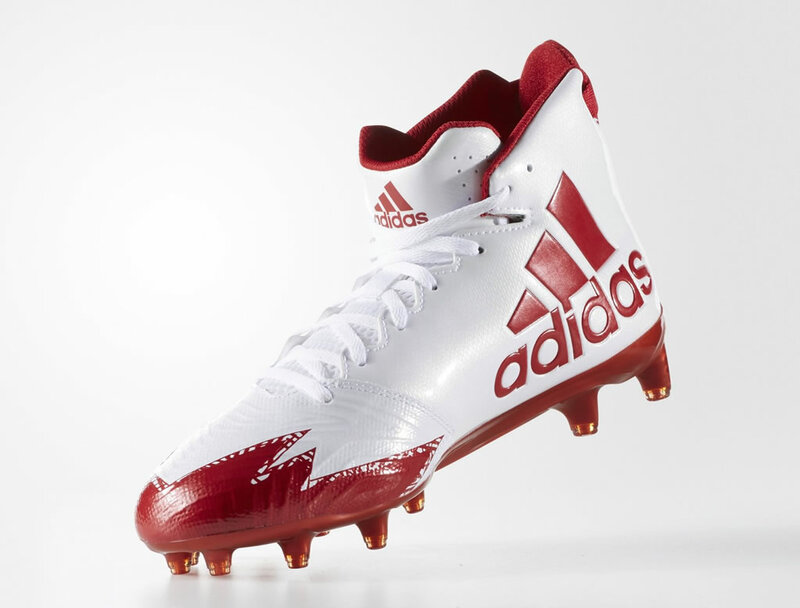 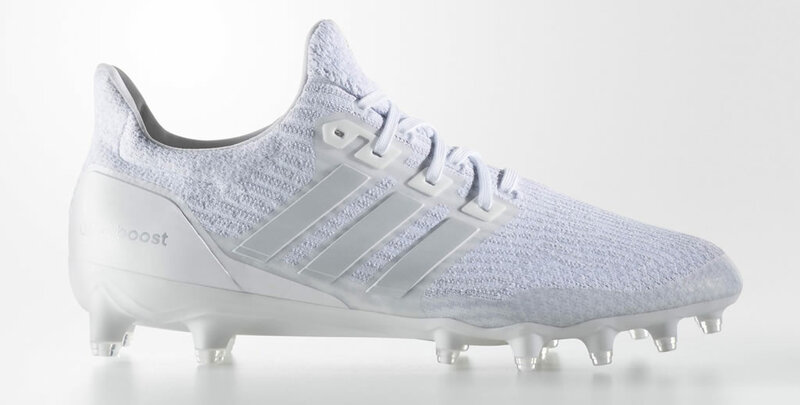 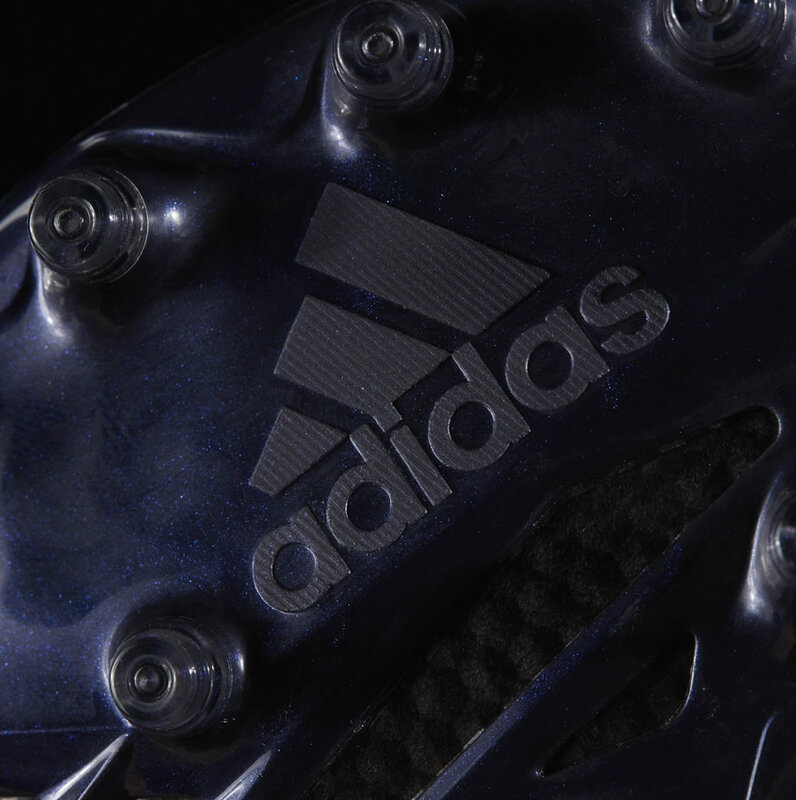 Dubbed adizero 5-Star 6.0 Gold Football Cleats, these Adidas football cleats boast an anatomically molded EVA insole, and a heel cup that locks the foot in for an enhanced stability and traction. 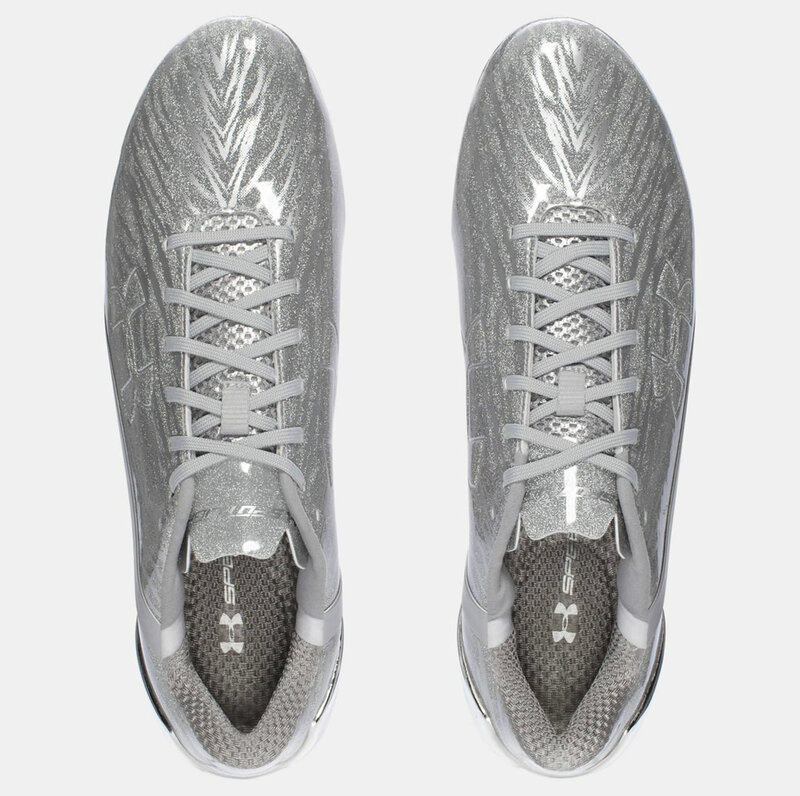 The SPRINTFRAME plate balances out lightness and stability, while the mesh lining provides fantastic breathability and support. 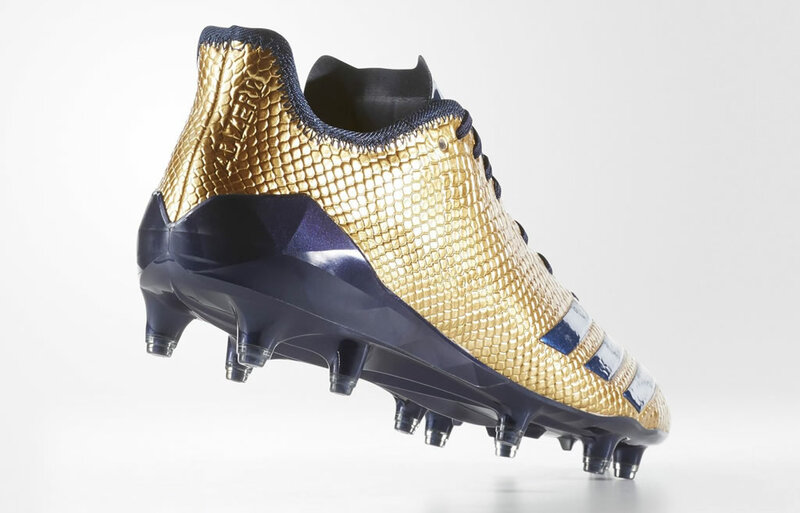 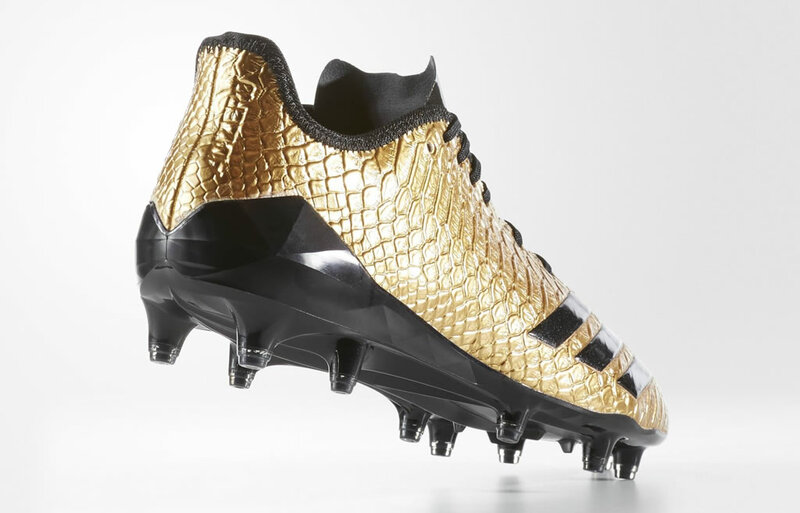 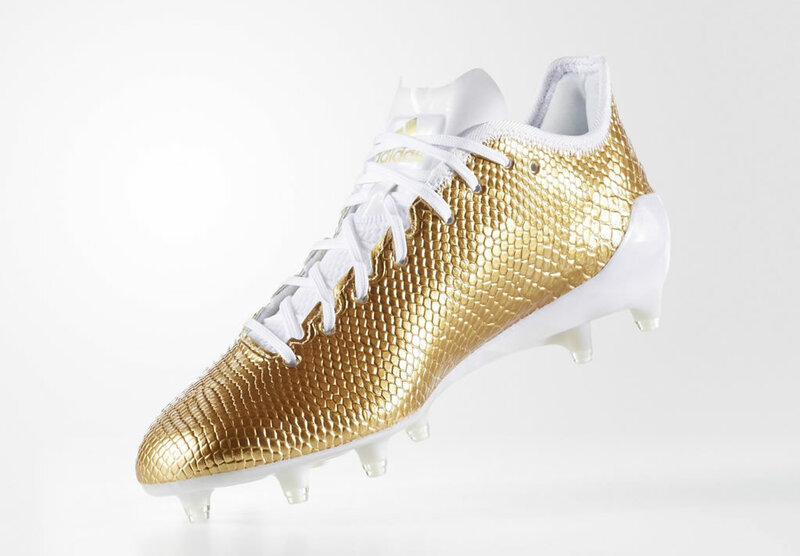 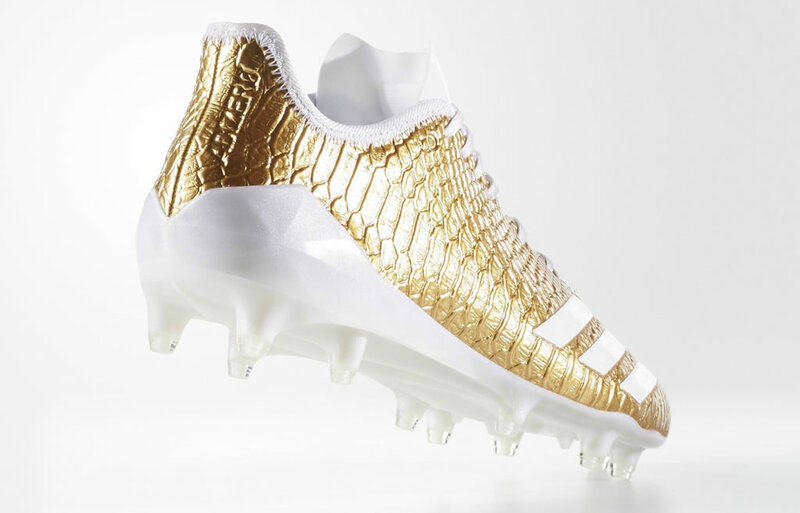 These black and gold football cleats by Adidas are available in six eye-catching color combinations, and they were created using a premium synthetic snakeskin upper. 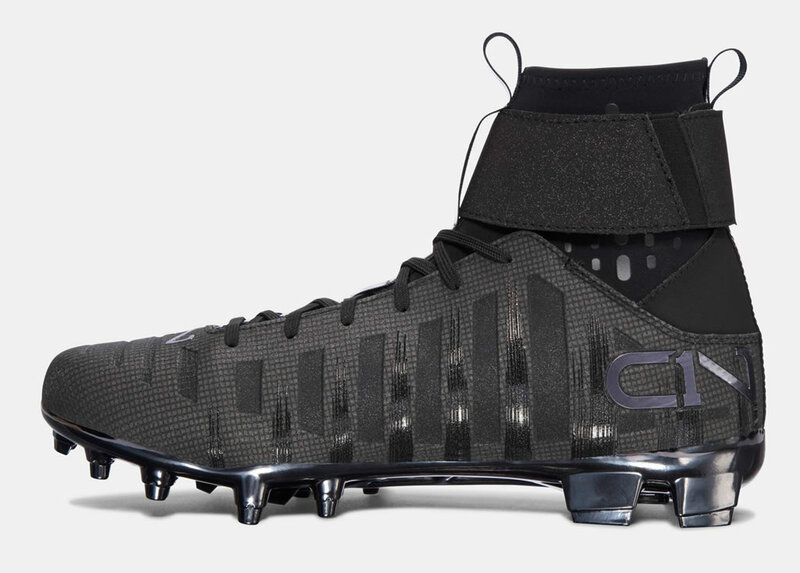 Moving on to the C1N MC by Under Armour, we’re looking at a very impressive pair of cleats, which was designed exclusively for Cam Newton. 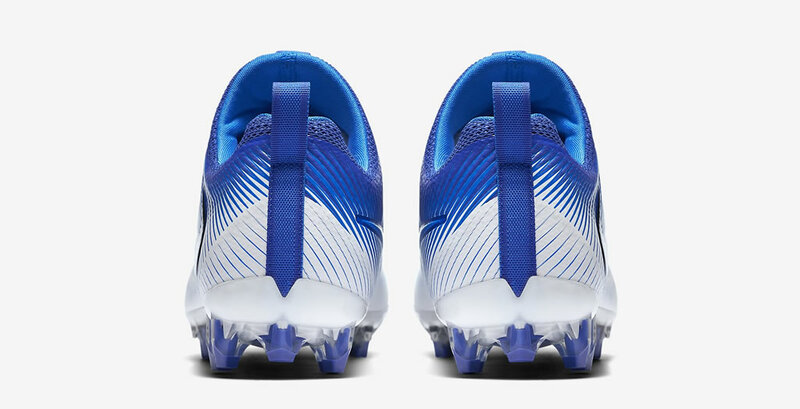 The reinforced performance upper and the removable ankle strap go a long way towards ensuring comfort and support even during the most intense matches. 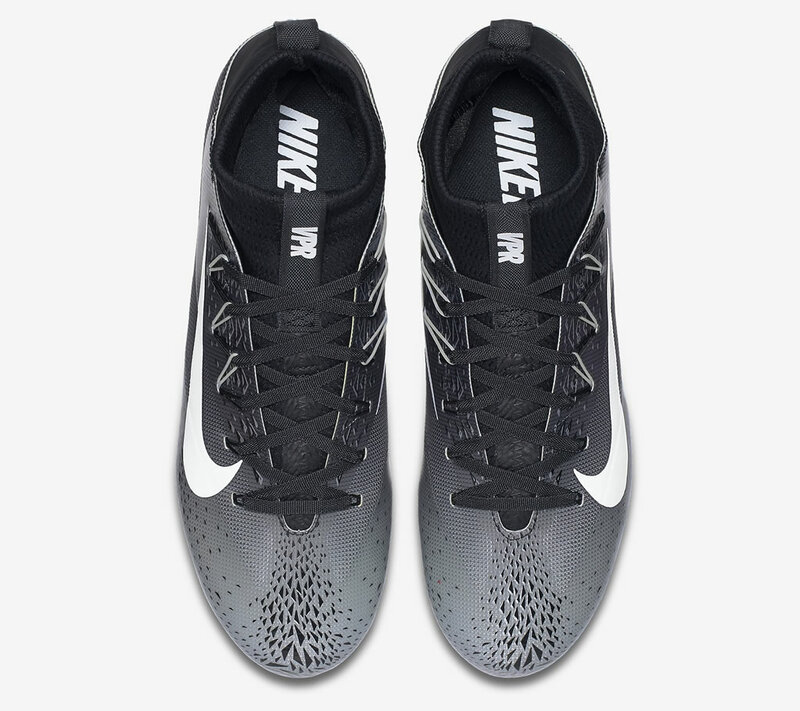 As for the outsole, it was made out of black chrome carbon, which ensures a lightweight and powerful platform in order to help you achieve an explosive speed. 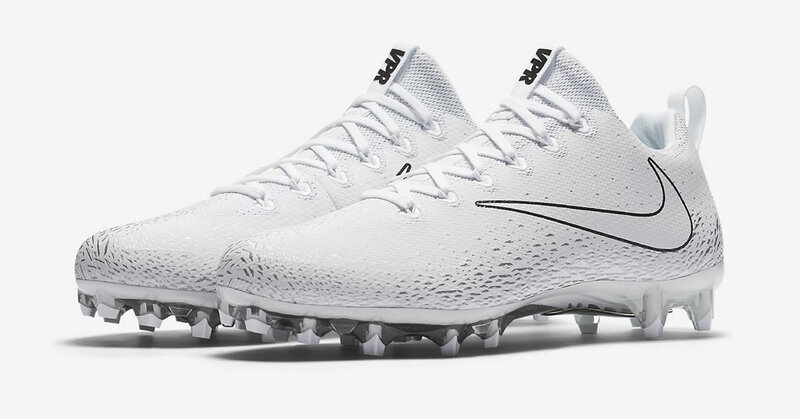 Available in Black/White/White, the Force Savage Elite TD flaunts a TPU plate with aggressive cleat configuration that enhances stability and traction, as well as Lunarlon foam midsole for extra cushioning at impact. 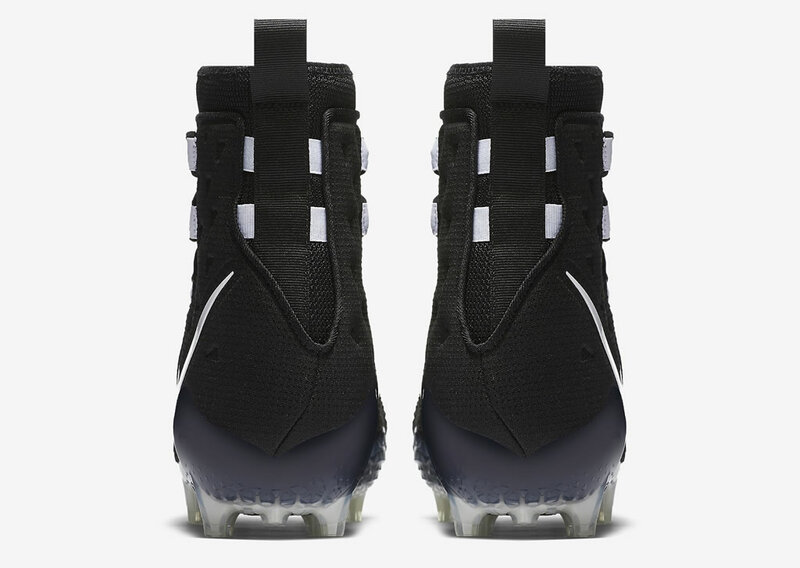 Designed with a high-top upper, these men’s football cleats for wide feet from Nike provide an adaptive and secure fit thanks to their light yet strong Flywire cables mix with laces.